Just me, my husband Graham and our collie-dog Seren on this trip. We set off from MK just before 8am on our way to Wroxham, having said goodbye to the boys (and made sure Harry, son No.1, had woken up properly as he had a morning shift at work). 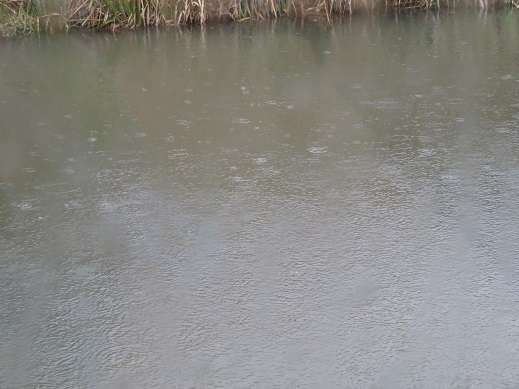 It was a drizzly start and though it soon dried up the sky remained pretty grey all day. Stopped at our usual Caxton Gibbet Costa’s coffee break. This time though we didn’t stuff ourselves with toasties as we normally do on our journeys to Norfolk (on the first day of our last trip I didn’t really want lunch due to still being full of toastie), instead Graham had cake and I had a teacake. Back on our way, getting to Wroxham shortly after 10am. Took Seren for a walk along the river bank but retreated quite quickly from path beside the Hoveton Viaduct moorings as Seren started barking at canoeists. 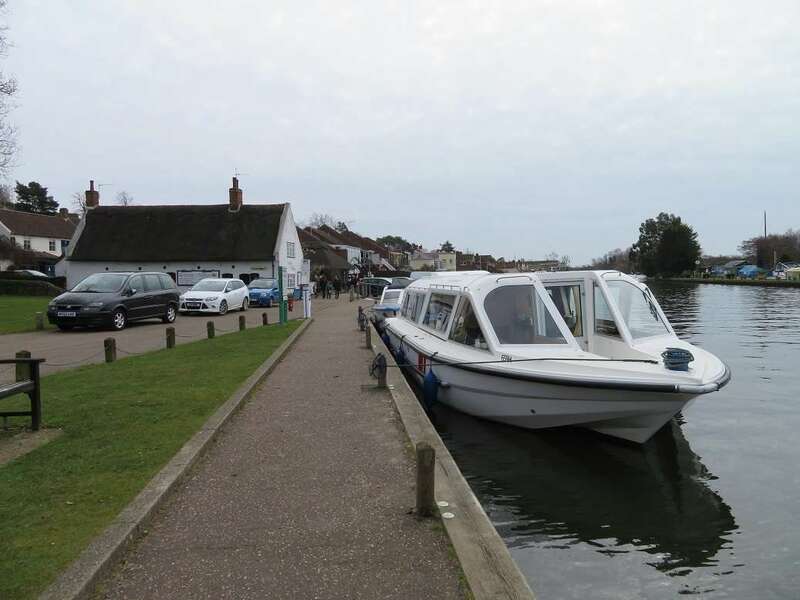 There were no boats moored at the Hoveton St John moorings, and just one private boat outside the pub, but then there was less than 7’ clearance showing on the bridge. We left Seren in the car whilst we went to Roy’s for our fresh-food shop. By the time we’d done that (and wasted a lot of time dithering over what to buy at the meat counter) it was just after 12. We had a sandwich lunch in The Old Mill Café (very nice too, I like the way they give you the Marie-rose sauce in a little pot so that you can suit yourself how much you put on your prawn sandwich) and then made our way to NBD for our agreed pick up time of 1pm. As the season hadn’t really started yet, the usual NBD reception wasn’t yet open and we reported to the main Broads Tours reception, before going to the marina office to pick up buoyancy aids. We didn’t hang about once we were shown the boat, but quickly unpacked the car and then had our handover. This was thorough in terms of showing us the essentials, including engine checks, but not overly long. The guy doing the handover mentioned that he could take us under the bridge, which was a boon as (a) the official pilot service hadn’t yet started and (b) we hadn’t thought that there would be enough clearance. He advised us to phone the office when we returned down-river tomorrow morning, and that we should be okay to return through the bridge from around 10am onward. What a great way to start our holiday! We love the stretch up to Coltishall. We took it easy, ticking over at 3mph, getting used to the slower pace of life. 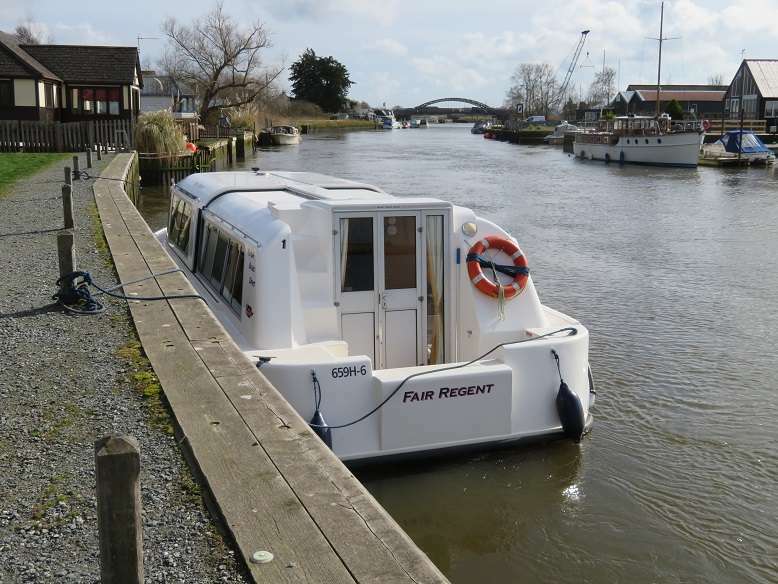 Unlike Fair Regent 2, that we hired last September, we had no problems with the throttle on Fair Regent 1 and could go as slowly as we wished, even slower than 3mph. 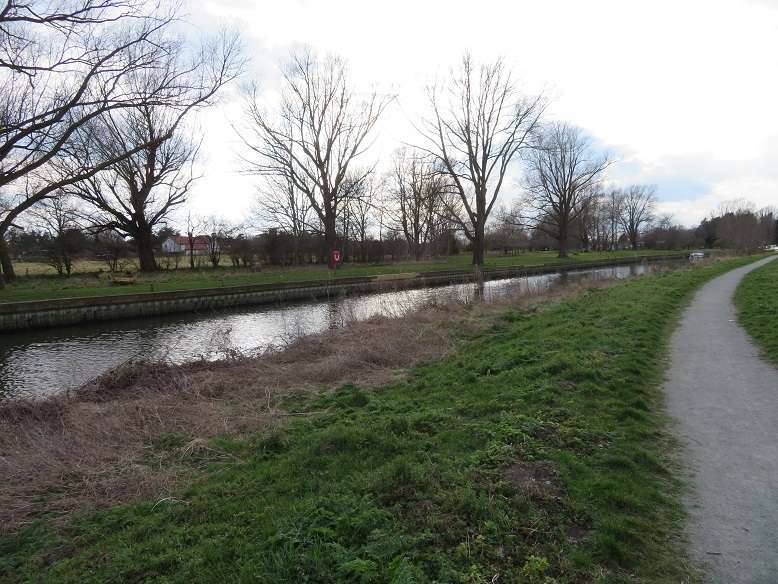 We had just passed the Wroxham Caen Meadow Staithe when Seren started to whine and we realised it was a while since she’d had a ‘comfort break’. Quickly turned around and moored up at Caen Meadow for the necessary before continuing on our way up-stream. 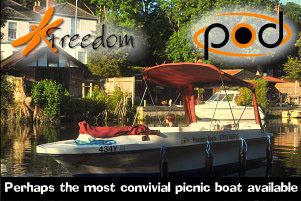 There was one other boat at Coltishall Common when we arrived just before 4pm, and they soon left, leaving us the only boat near the electric point (good start - 41p credit left on the post). Another boat arrived later, but they moored the far end of the moorings downstream. Graham took Seren for a walk along the common while I walked to the Church. Unfortunately, it was locked, which is unusual for a Norfolk church during daylight hours. Mind you, it was after 4pm. 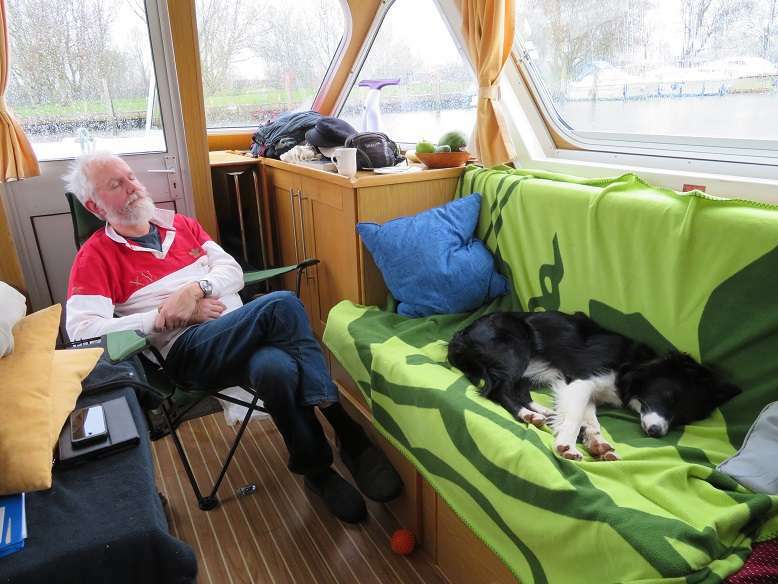 Once back on the boat we unpacked and made the bed and then relaxed for a while before dinner. I spent some time watching a couple of swans that seemed to be doing some synchronised swimming ritual (courtship?). A really beautiful sight. We didn’t bother with eating out this evening. Yesterday Graham had an endoscopy examination to check out possible causes for the acid reflux he’s been suffering from. They advised that he’s got a small hernia, so he needs to be careful about what he eats and avoid eating very large meals and fatty food, especially in the evening, so we’ll probably self-cater on this holiday more than we have done in the past. I cooked some lamb steaks with some veg. It was a chilly evening, but we were quite cosy with the heating on. Watched some TV and had an early’ish night. The only snag about Coltishall was that the ground was pretty sticky, especially around the electric post, though the grass hadn’t been churned up fortunately. Good job we had brought our wellies. We had also brought a small 1kW oil-filled radiator with us, which we had on overnight in the cabin. We had it on a low setting the first night, not being sure how much electric credit it would draw down. It did help keep the chill off. Seren woke up about 5am (4am by yesterday’s time, but the clocks went forward in the night). The first cars had started going past but it wasn’t yet light. Normally at home she’s fine until about 7.30 to 8am. Graham took her outside and then returned her to her crate. 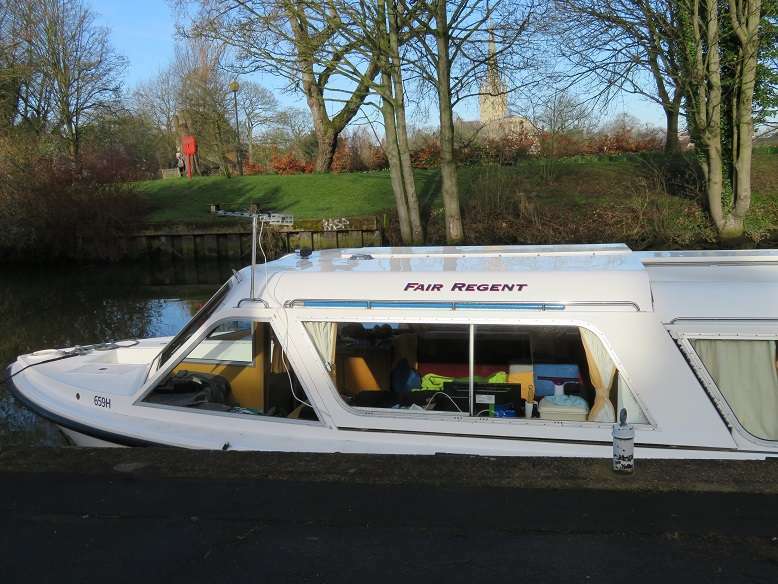 However, by then I was too wakey-wakey to go back to sleep, so I got up at 6am and about an hour later made a cooked breakfast (sausage, tomato, fried potatoes, scrambled egg), then we both had baths as the water was lovely and super-hot (this boat has a corner bath with shower over). We set off from Coltishall just after 9am. It was a bit grey, but the sun came out as the day progressed. It was so lovely and quiet on the river. 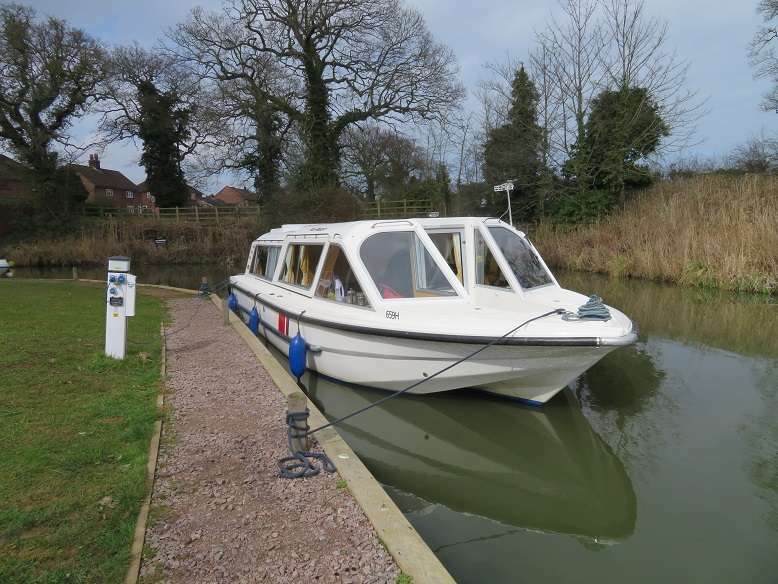 Plenty of room at the Hoveton St John moorings again this morning, so no worries about doing my first stern-on mooring of the holiday. A pilot came along quite quickly once we’d called the office. Once under the bridge he hopped off onto one of the moored day boats and we were off on our way down the Bure. It was a pleasant morning, with the odd gleam of sunshine, and brightening as the day progressed. We had a detour around Wroxham Broad, admiring the posh boat-houses. I had to slow right down as we approached Horning, as some youngsters were having a race. There wasn’t that much wind, so they were moving quite slowly and although there weren’t that many of them they were pretty much strung out across the river, so it was a case of slowing right down and then coming to a standstill near the reeds until a decent gap appeared. It was coming up to mid-day as we approached the Horning bend, and there was one space on the Staithe, which we quickly nabbed. Just nicely timed to get some lunch. 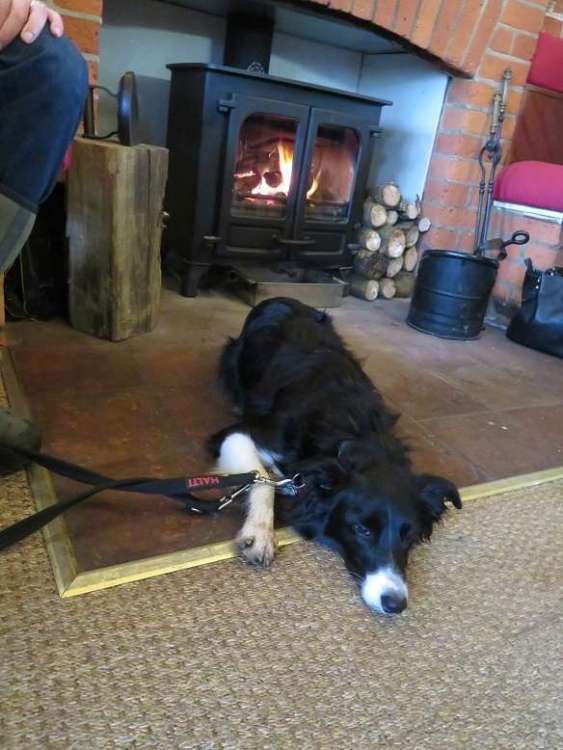 I would have liked to have tried The New Inn, but gather that they don’t allow dogs inside and we felt it was too chilly to sit outside, even though it was quite sunny by now. We had lunch in the Staithe and Willow. 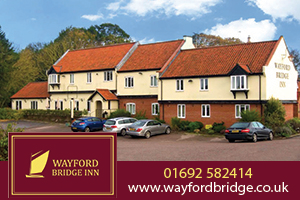 We’ve been there several times previously for breakfast, which we’ve been impressed with (good quality sausages and bacon and always friendly and efficient service). We were pleased that there was a choice of large or small adult portions of their Sunday dinner as well as a child’s portion, and we both opted for the small portion of their roast beef. It was okay and reasonably priced, but we weren’t that impressed. The beef was tender enough, but it was a bit tasteless somehow, and for us (as we like our roast beef to be pink in the middle) it was overcooked. The cauli and broccoli were a slightly mushy, peas and carrots were fine, but the roast potatoes were undercooked and just about edible. The yorkshires resembled ‘Aunt Bessie’s’ rather than home cooked ones and the gravy tasted like the instant variety. The service was very genial and attentive, and they are very dog-friendly. 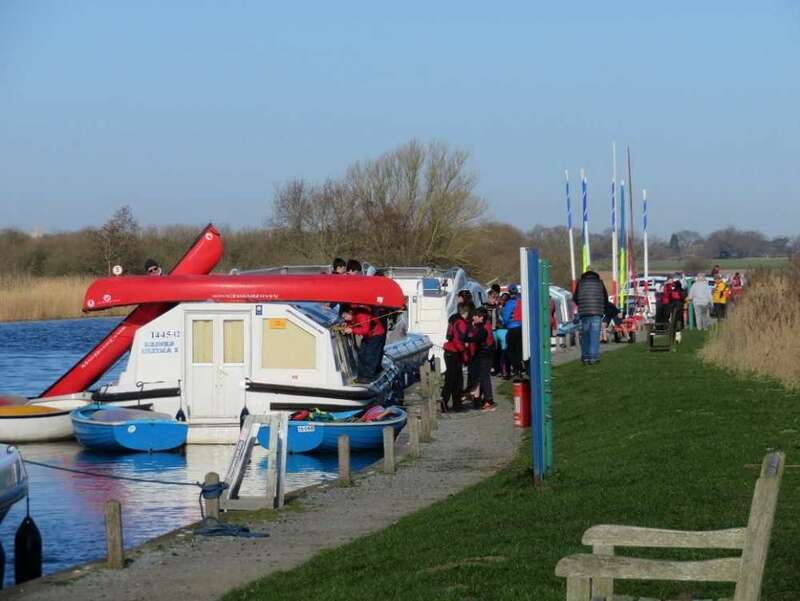 The river was slightly busier below Horning, with a few private boats around, plus some day boats and several hire boats mostly from Herbert Woods. Going up the Ant we met some Richardson’s boats. There were a few boats moored at Ludham Bridge and about four or five at How Hill, but we were able to cruise in a leisurely fashion up the Ant without any other boats following us. Shortly before Irstead Seren started whining, so we stopped briefly at one of the wild moorings before continuing up-stream. Our plan had been to make for Dilham, as we thought that would be our best bet for an electric post on the Ant. 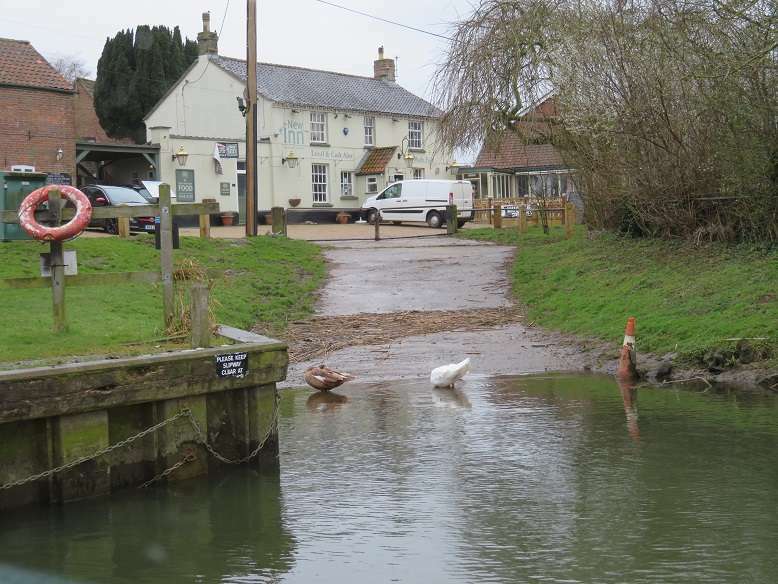 However, we struck lucky at Irstead, with the Staithe being unoccupied. 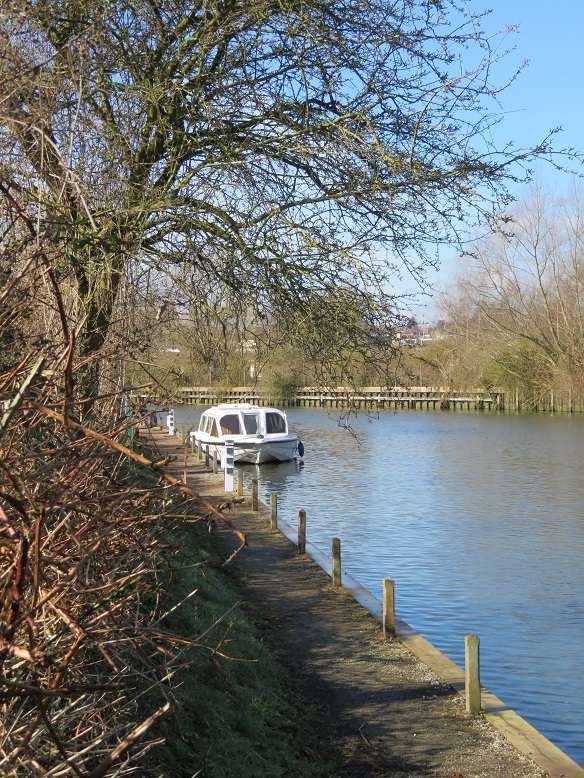 What a lovely, peaceful mooring that is! Lovely not to have any road noise. The Staithe was far less muddy than Coltishall with a fresh lot of chipped back along the key heading. The Church there is very interesting and welcoming (large ‘open’ sign near the gate), with lots of very old (i.e. pre-Victorian) features, including medieval wall paintings, font, carvings and glass and an Elizabethan pulpit. 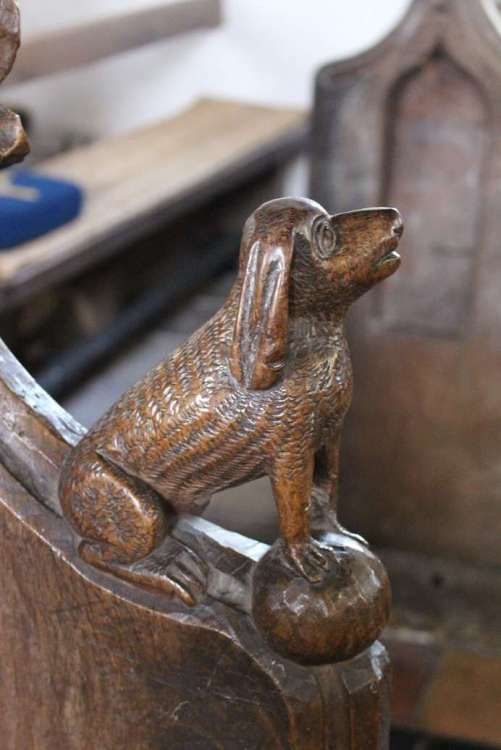 I liked this pew-end...it's it cute? When I got back to the boat the sun had warmed up the interior beautifully. 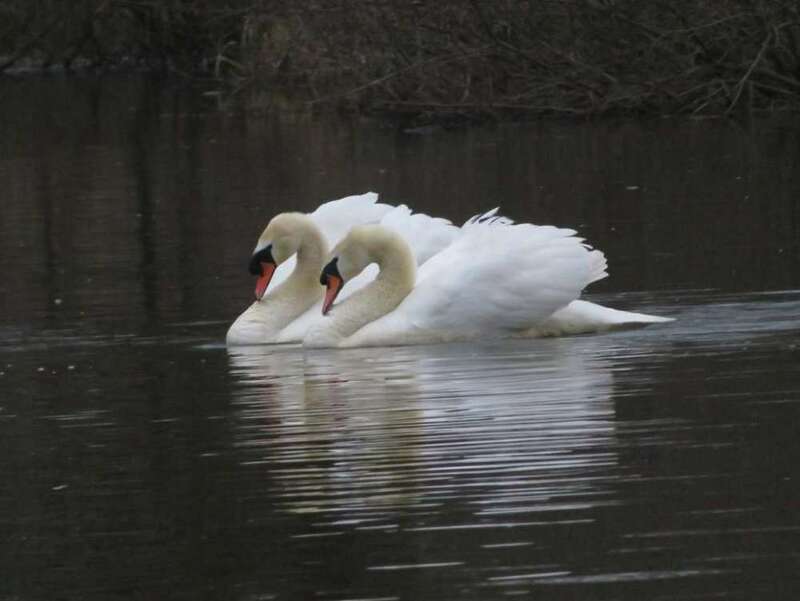 Spent some quiet time writing up my log and then had to spend some time calming Seren down as a swan had popped its head up and hissed at her. This evening I made a tomato, onion and bacon sauce to go with pasta and then we watched some TV as the sun was setting – the extra hour of evening daylight makes so much difference! We turned our electric radiator up to its maximum setting tonight as a cold and frosty night was forecast. Looking forward to more of this Helen. 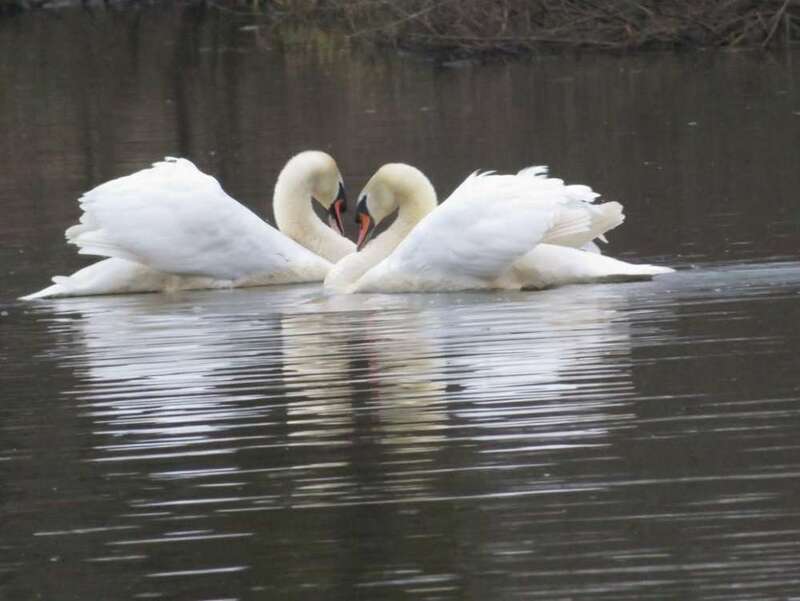 The pictures of the swans in your first post are particularly lovely, definitely a courting couple. Yes, really enjoying this too. Getting me in the mood for our visit to the broads next month. Yesterday evening we decided to completely change our plans for today. 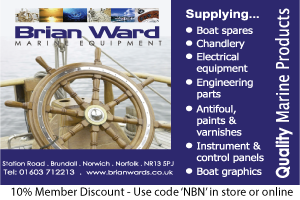 We had intended going to Ranworth or Potter H and then travel down south on Tuesday, but instead we decided to head down south today and to leave Irstead at 8am to have plenty of time to catch slack water at Yarmouth at lunchtime. Seren started whining again about 4am this morning (my fault - I disturbed her by going to the loo), so I crawled out of bed, put some clothes over my PJs and took her out. I was rewarded for my pains by the most spectacular starry night’s sky. Tucked Seren back in her cage again for some more sleep. The radiator was making a real difference to the temperature in the cabin, keeping the chill away, and our fluffy covered hot-water bottle was still warm from last night too (the hot water supply had been so hot last night that we had just filled it from the tap). Seren woke up again as it was getting light and, as I hadn’t really gone back to sleep soundly, I got up, layered lots of clothing over my PJs again and tried to keep Seren quiet so that Graham could have some more sleep. I was again rewarded because we had a lovely sunrise. Beautiful! 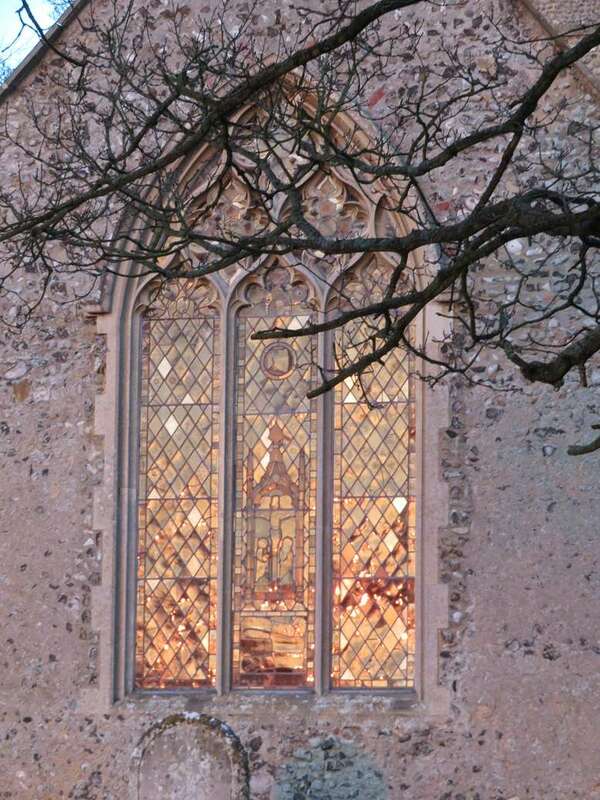 I went out to take a few photos of the dawn, including one of the sun reflecting in the east-window of the church. It was very frosty though! Graham got up just before 7 and it took us an hour to sort ourselves out: take Seren out, take the exterior blinds down (which were covered in frost) and clear the windows of condensation. 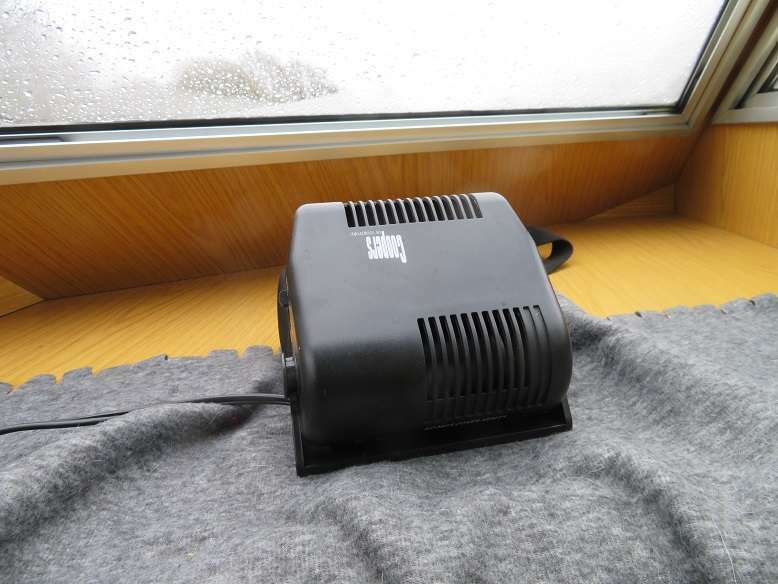 Graham had bought a portable window demister which plugged into the 12V socket and blew warm air on the window in front of the helm. Came in really handy during the week and it had cost him less than a fiver in a sale. We had a lovely sunny cruise down the Ant. 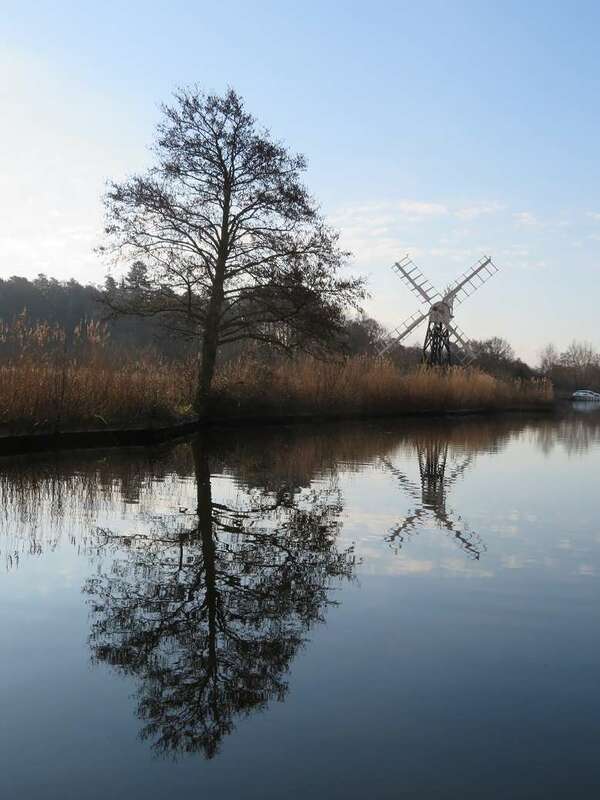 As we set off from Irstead we saw three Richardson’s boats going upstream – I assumed they were handing their boats back after the weekend as it was very quiet again once they’d passed, with only a few boats moored at How Hill and Ludham Bridge. The St Benet’s moorings looked pretty much full though. The majority of the mooring space was taken up by a troop of Norwich Sea Scouts - they had a large number of dinghies, canoes and support boats. How lovely! Hope the kids enjoyed their day. Glad we had passed St Benet’s before they got going with sailing and canoeing though! There was space for a couple of boats right at the downstream end of the moorings and we stopped there so that Seren could have a good run around before we travelled down through Yarmouth. We had a beautifully sunny walk around St Benet’s. 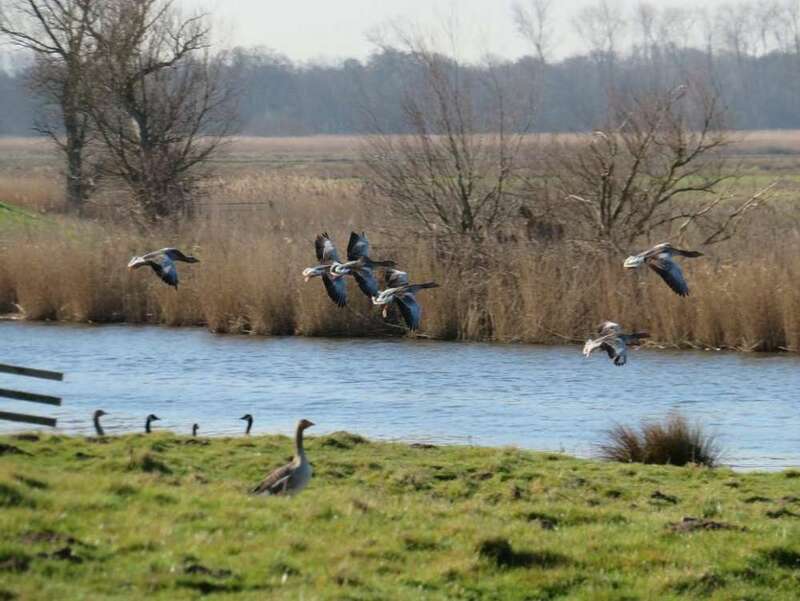 During which Seren disturbed a flock of geese that flew off to the river. 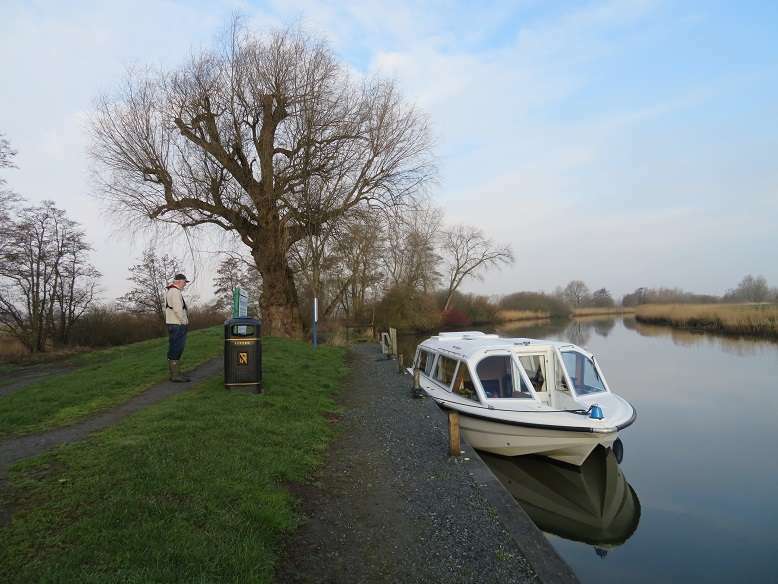 We then continued down the Bure to Acle with a brief stop there to top-up our water, then down past Stracey Arms and through Yarmouth. We realised that as we were passing through Stracey Arms around 11.30 we ahead of schedule for slack water at 1pm, so dropped our revs to just tick-over until we passed the 5 Mile House Drainage Mill about an hour before slack water, so we then increased our speed to around 5mph and got through Yarmouth in perfect time for the slack water. On our way down the lower Bure Graham made us sandwiches for lunch, which I ate at the helm. We tried increasing speed over Breydon Water, but the engine wasn’t having it. Anything beyond 1400rpm it just went all ‘lumpy’ as if it was threatening to stall itself – not something I wanted to happen on Breydon! 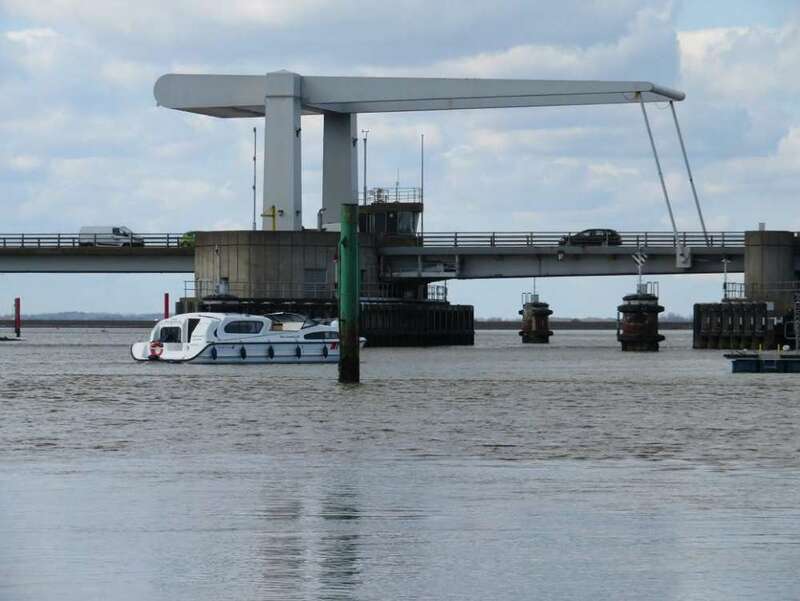 There were just two other boats in the distance on Breydon and nothing came the other way apart from the mobile platform that the BA was using to renew the marker posts. 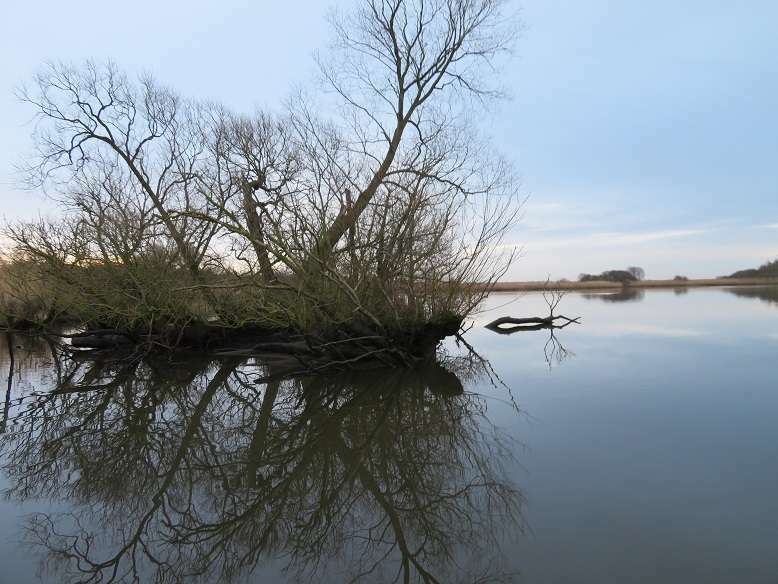 We noticed there was far less mud showing on the lower reaches of the Bure and on Breydon water than there had been when we crossed last year. I guess that was probably due to a Neap tide being due tomorrow, also the river levels were probably a bit higher due to rain. 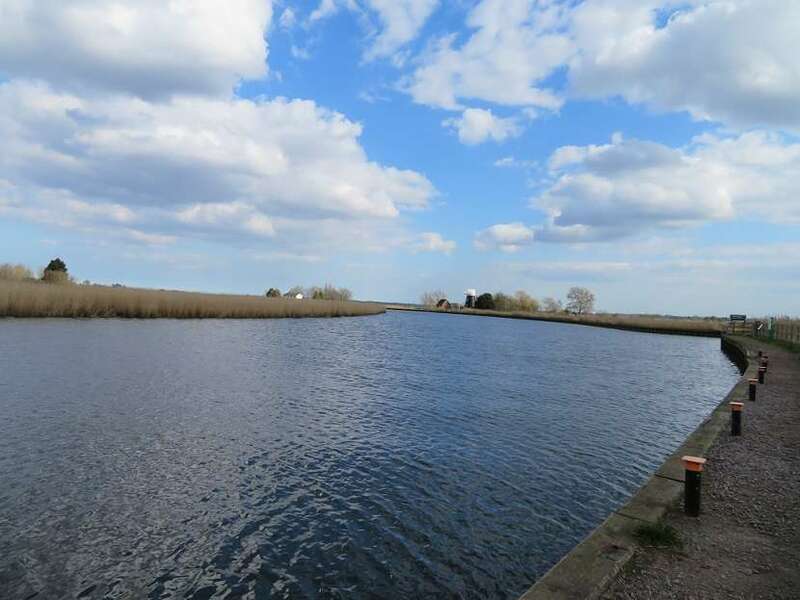 We turned up the Yare at the end of Breydon. 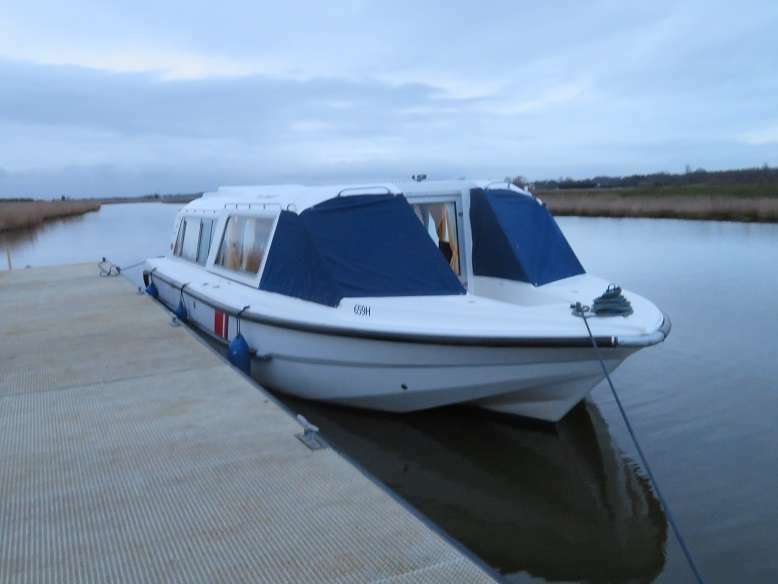 Reedham was very quiet, with plenty of room for us near an electric point had we wanted to stop there. 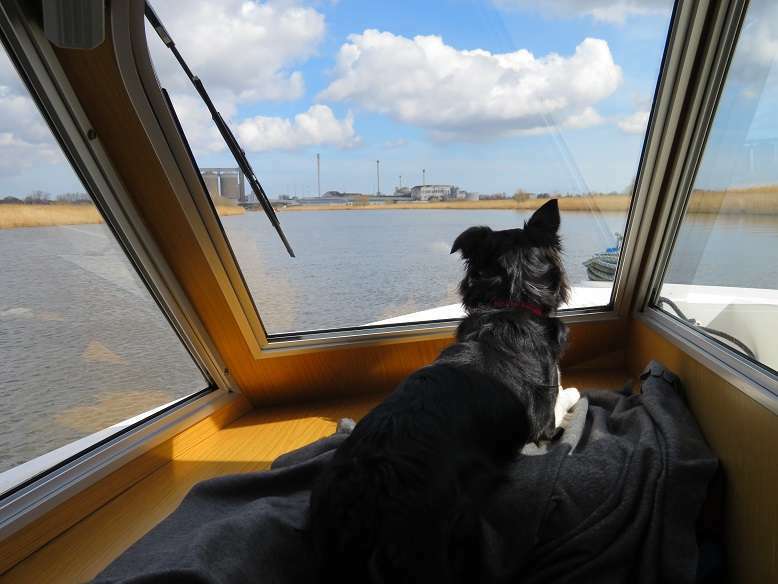 We did stop for a short time at Hardley Cross moorings (the ones near the mouth of the Chet) – again for Seren as she had started whining and hadn’t been off the boat since this morning at Acle. Just as we were setting off again a Richardson’s boat turned up the Chet just before us. Very handy as we’d be forewarned if anything came downstream (nothing did! ), so I could be a bit sloppier about taking care around the bends of the river than I would have done had they not been before us. 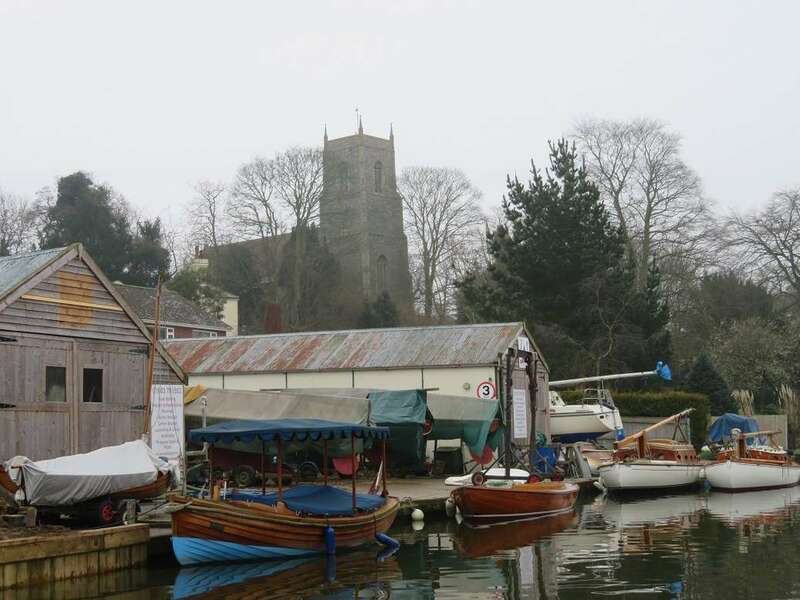 Luckily when we got to the Staithe around 3.30 there was space for at least four boats. Last time we visited Loddon we took Seren for a walk through the Loddon churchyard and along the Wherryman’s Way foot path to Pye’s Mill. This time we took her in the opposite direction through Chedgrave and found the section of the Wherryman’s Way that goes past the Chedgrave church and along the opposite bank, down towards Chedgrave Common moorings. Pye's Mill moorings were empty apart from one sailey at the far end. On the way back, I had a detour to Co-Op to get some more wine (can’t risk running out of wine!) and Bridge Stores for some more electric cards (not that we were anywhere near running out of them). Had salad with locally smoked mackerel and rollmops for dinner and then watched Masterchef. Went to bed shortly after 9pm – tired out! 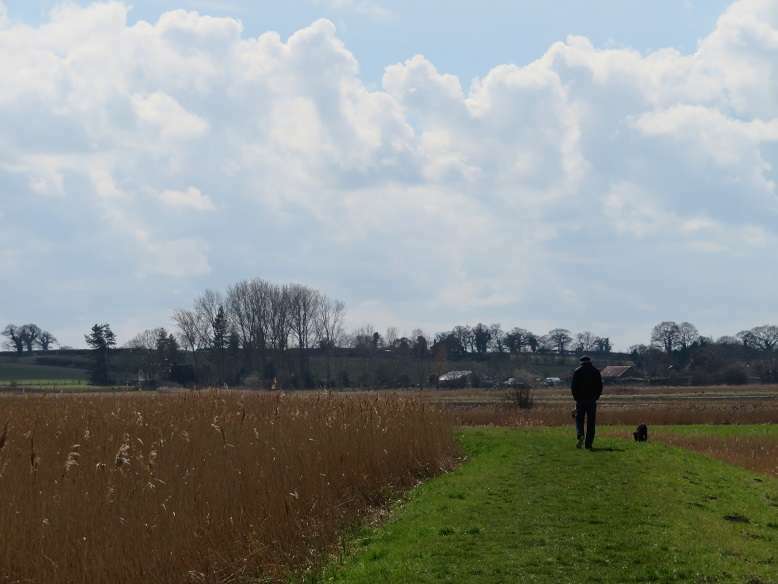 We originally thought that we would stay in Loddon today until after lunch, so as to catch the last of the outgoing tide down the Chet and then the incoming tide up the Yare. However, the weather forecast for the morning promised rain, clearing a bit in the afternoon, so we decided to get on our way by 8.30. It was a bit drizzly to start with down the Chet, but not too bad. 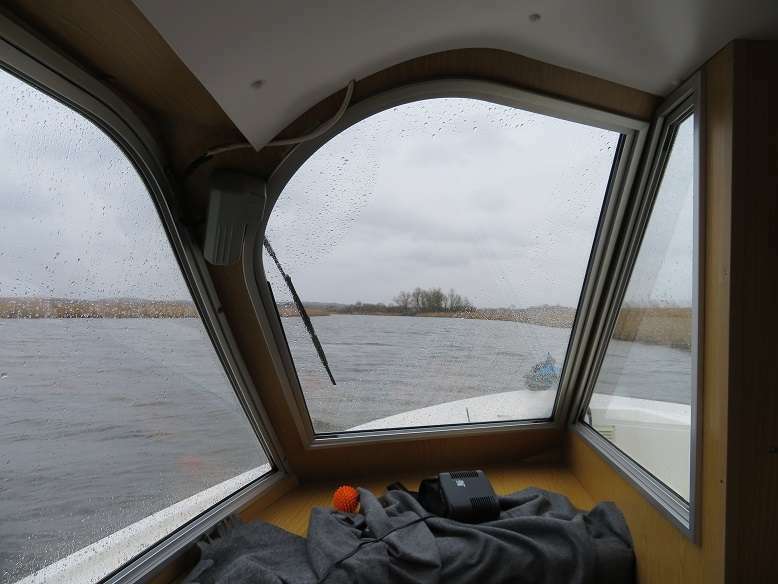 The wind and rain picked up on the Yare and it was pretty gloomy really, and as the engine was struggling again with anything over 1400rpm we had to content ourselves with chugging along around 5mph or just under. The dog managed to stall the engine at one point (and no, she wasn’t helming!). My fault again! She was on the seat that is just before the helm and facing me when I used the windscreen wiper on the window that was behind her. She jumped up in fright and knocked the throttle forward slightly (not that much really – made me even more wary of trying to push this engine beyond what it was comfortable with). 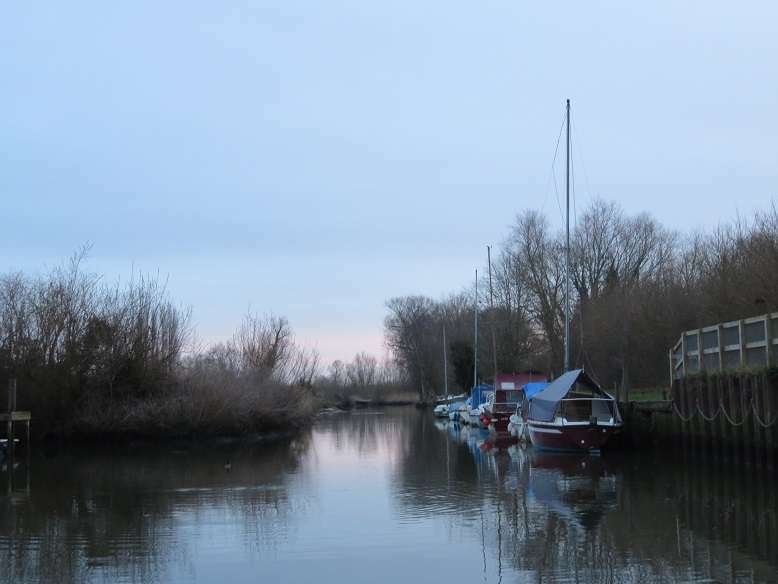 The Yare was very quiet, only a couple of boats passing us on our way to Rockland St Mary. We got there just before 11, just in the nick of time really as there is only room for three boats near the electric point. There was a boat there when we arrived and another followed shortly after. Graham cleaned down the key heading with our mop as it was covered in goose poop. 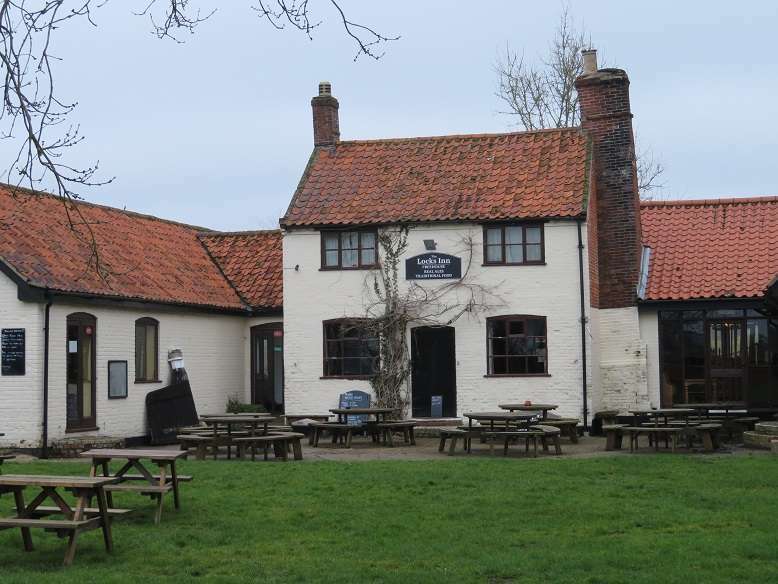 We had lunch in The New Inn, both having BBQ ribs, chips and salad. It was very tasty, despite my putting tartar sauce on my chips by accident (partly Graham’s fault for telling me that the mayo was in blue sachets). Actually, it didn’t taste too bad! After lunch we relaxed on the boat for a while before setting out on a 7½ mile walk along Short Dyke then along the bank of the Yare as far as the Beauchamp Arms where we branched off inland to Claxton. There were so many swans in the fields either side of the dyke that the path bordered - I've never seen so many together. 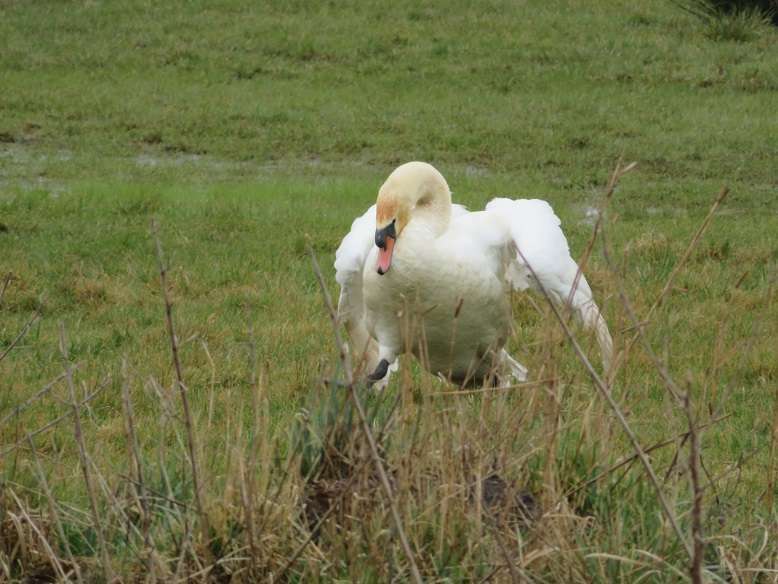 One of the swans was doing peculiar ‘funky chicken’ type moves towards his fellows – I assume it was a male rivalry thing as the other swan flew off to the next field. We walked through Claxton village and then up a lane that led up the hill to the church. 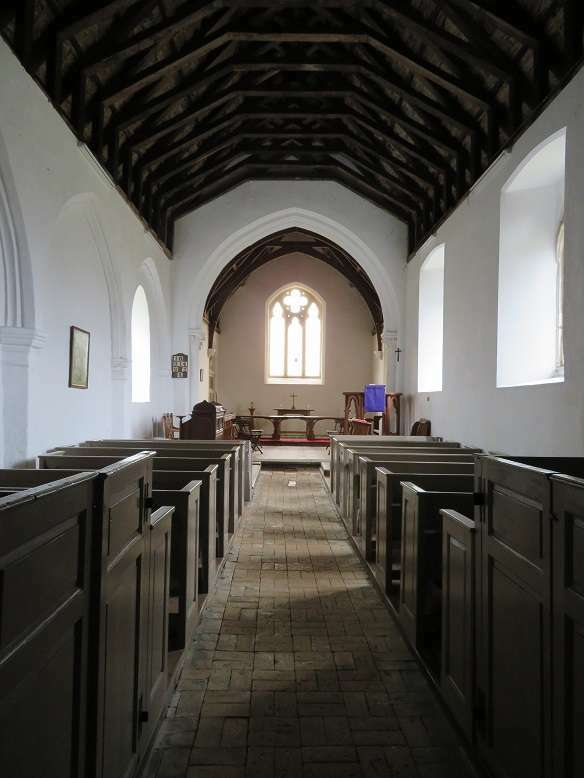 Claxton Church interior is lovely, quite simple in style, with its interior being mostly Victorian/early 20th century (I assume- I'm no expert on these things!). It has some devotional pictures that are very much of that era. 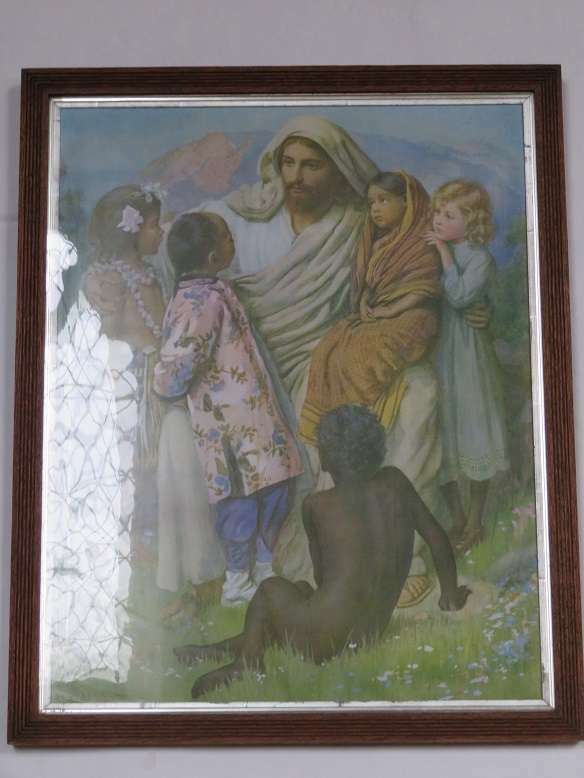 Rather ‘sweet’ pictures of Jesus, including one of him surrounded by children from different parts of ‘The British Empire’. Quite unusual to see such pictures nowadays as they are considered a bit ‘un-PC’ what with Jesus being quite light-haired, the dark skinned kid being naked and all that. Spent the rest of the evening on board. TV reception was rubbish, as was signal for my mobile Wi-Fi, but we were happy just reading. We were both still pretty full after our lunch and just had some toast this evening. We’re no longer used to having large lunches. Great start and photos Helen. I enjoy your detailed write ups. I've never hired a boat with onshore power but I can see the benefit with that extra heater you brought. What a fabulous write up and photos. That sunrise photo has got to be a contender for the calendar! Woke early again this morning, but that wasn’t a problem as we wanted to start off just after dawn for Norwich to take advantage of the tide and get to Norwich at a reasonable time so as to have a full day there. It hadn’t been the most restful night. Rockland St Mary is a lovely quiet mooring, as the road behind it isn’t busy. However, the young couple in a Ferry Marina boat moored next to us kept their heating on all night and the outlet was on our side. At least they weren’t running their engine, so we did get some sleep. 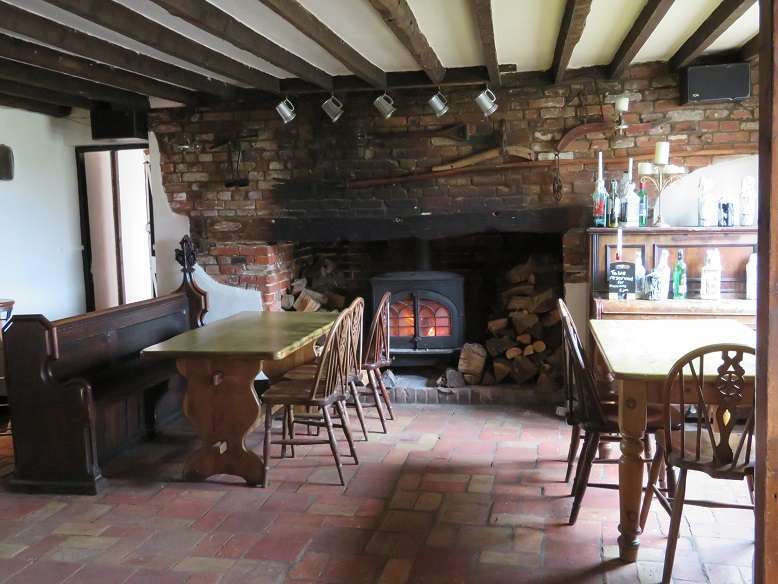 They had even left their heating on yesterday lunchtime when they were in the pub. Oh well, it takes all sorts. I love starting off early as I find the rivers are really something special in the early morning. The water on Rockland Broad was pretty still. We saw no other boats underway until we were nearing Norwich. The Yacht Station was pretty quiet, just three or four other boats moored up the end near the shower block. 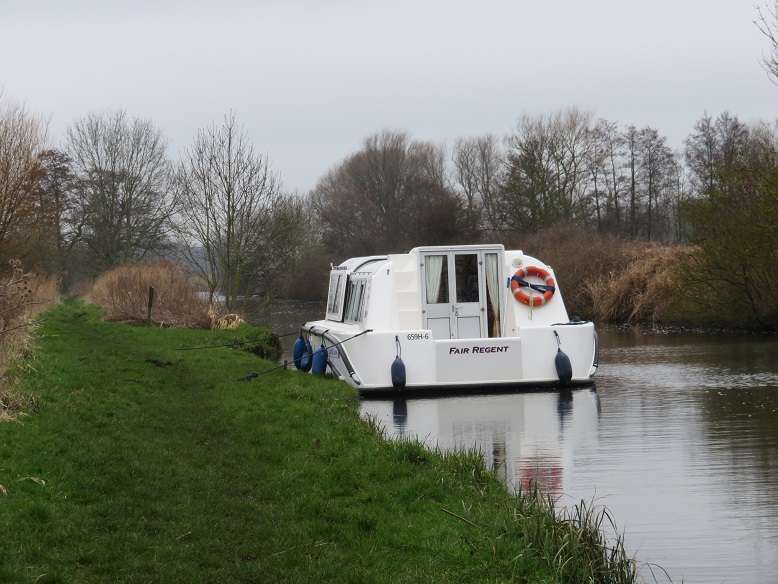 We continued past Pulls Ferry to moor up right at the far end next to the electric posts. We also had the mooring with the best view of the Cathedral. 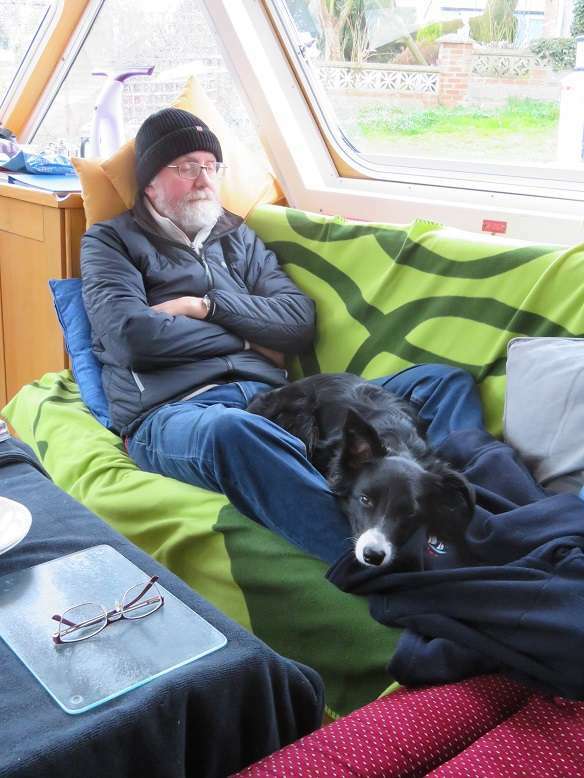 We’d had breakfast en-route this morning and had now had coffee and cake once we had settled on our mooring and had paid the ranger. It started raining pretty steadily and it looked set to rain for most of the day. Graham went off to Morrison’s with a shopping list. 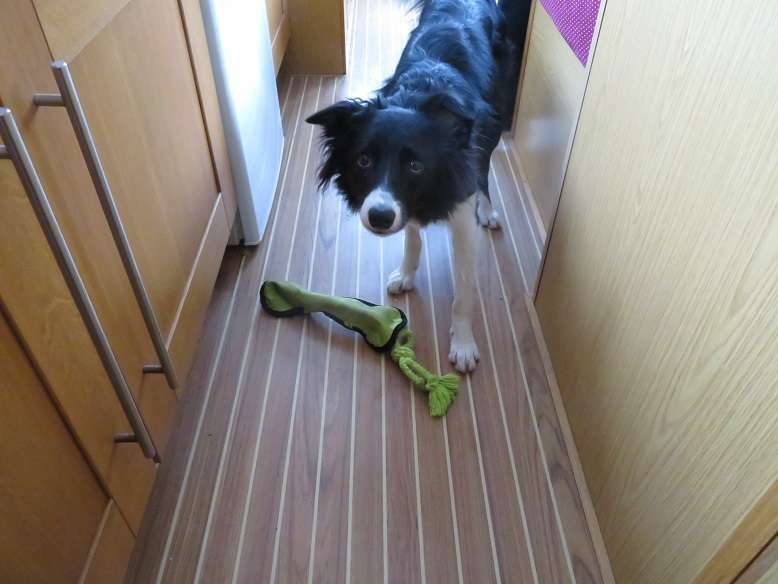 I stayed on board with Seren and prepared the veg for our evening meal. 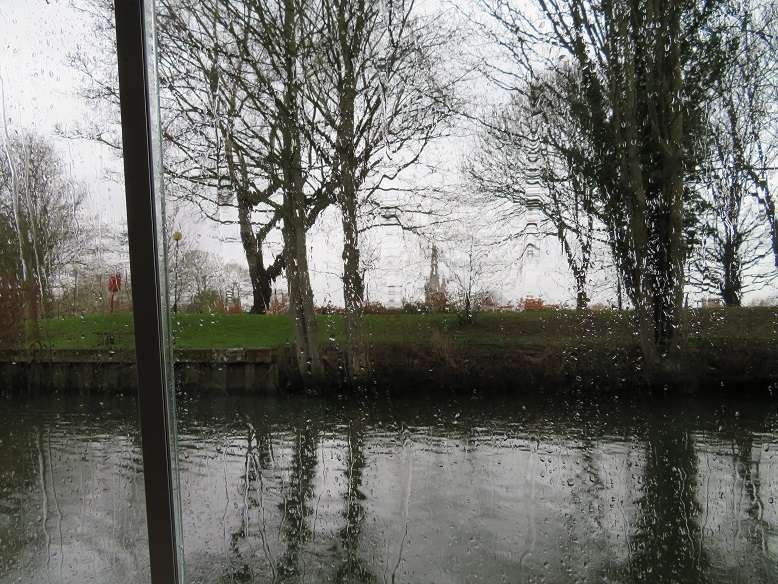 Once Graham got back I donned my waterproofs and set off to have a look around Norwich, crossing Bishop’s Bridge and then doubling back along the river bank to Pulls Ferry (too rainy to take photos unfortunately) and then up past the Cathedral into town. 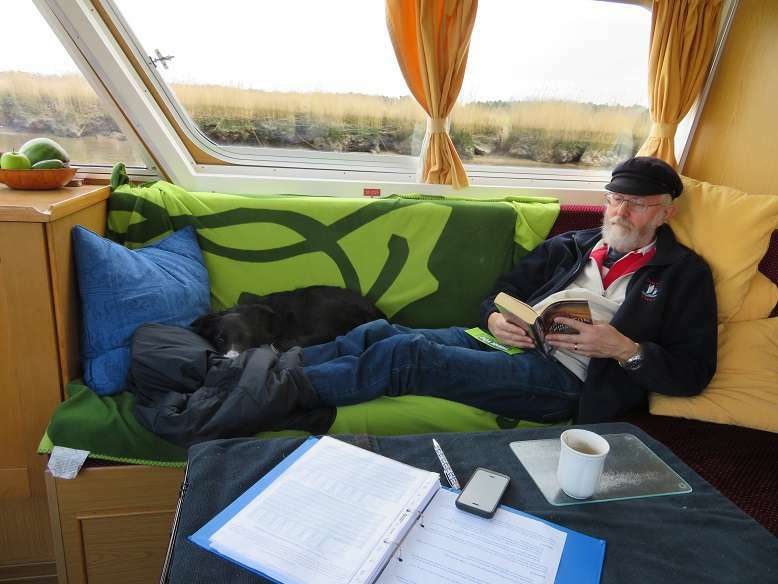 Graham was happy to just stay on the boat with a book and take the dog for a walk later. I found my way to the Market and tracked down a food stall that I’d read about which serves vegan food. I had their BBQ pulled jackfruit with spicy red cabbage slaw served in a garlic toasted bun. I’ve never had jackfruit before (nor even heard of it – I had to google it later to find out what it was) but I had heard good things about that dish and I must say I enjoyed it very much. It had a slightly meaty texture and was really lovely and tangy with a bit of crunch from the slaw. [Grace will recall from past accounts that I like trying out weird dishes!] It was a reasonable price too at £6.50 including a root beer. I recommend a visit to Norwich market - both for those who like to try out new things and those who like more traditional fare as there’s a huge variety of food stalls there. 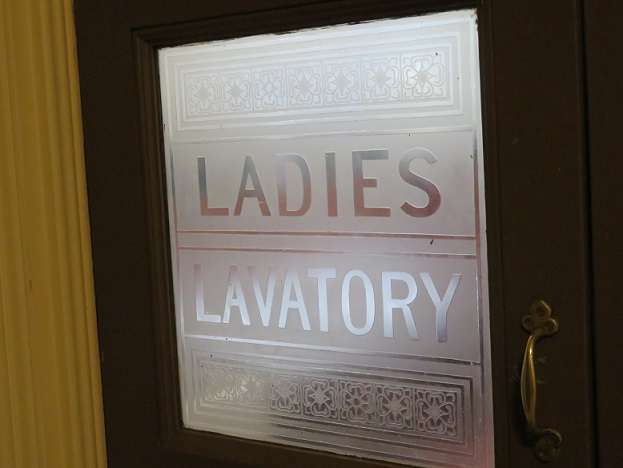 As it was still raining I decided to visit Castle Museum and whiled away a couple of hours in there, though I didn’t think there was that much of interest really, not worth the entrance fee anyway, though I thought the ancient ladies’ loos were quite interesting! 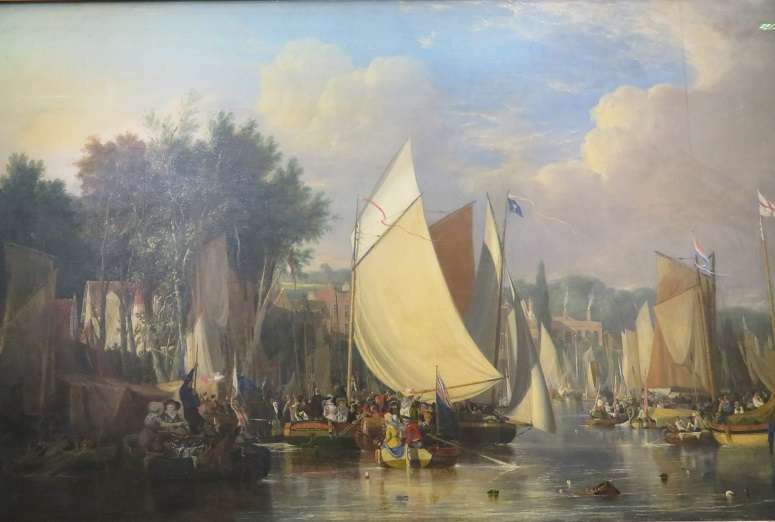 This painting of a river jamboree in Thorpe made me chuckle – imaging what todays ‘elf ‘n safety’ peeps would have to say about such crowds - both the number of boats and the number of people on them! From there I went for a wander around the Cathedral before returning to the boat. Just after I returned it stopped raining (huh! typical!) and turned out to be quite a nice sunny evening. This evening we watched Masterchef again, having had a dinner of sausages (from Roy’s), celeriac, potato and pear mash with green beans, fried pear quarters and some cheats (instant) gravy. We didn’t rush away from Norwich this morning, even though we woke early again. High tide wasn’t due until late morning anyway. We had a ‘light’ fry up – dry fried bacon, scrambled egg, tomato cooked in the microwave, fried potatoes and wilted spinach. This was my attempt at a less oily cooked breakfast as Graham is finding that fatty food doesn’t help his digestion. We had a pump-out before leaving the Yacht Station, as were (already!) half way though our holiday. Once out of Norwich we moored at the Whitlingham Park moorings so that Seren could have good run around before we set off again, as we were intending to make our way as far as the Waveney today. It was a fairly sunny morning with fluffy clouds. We noticed that there was a big change in Cantley compared to a couple of days ago, when it had been belching out steam. Seemed to be completely inactive today. The Yare was very quiet again and we made it as far as Cantley by lunchtime, stopping off at Hardley Draining Mill pontoon for Seren to have another run. We had a bit of a panic when Seren started chasing another boat that was going downstream, running along to bank to get ahead of it. We had visions of having to chase after her all the way to Hardley Dyke, but she did eventually heed our calls and came running back. After we got underway again Graham made some sandwiches. I ate mine at the helm again. 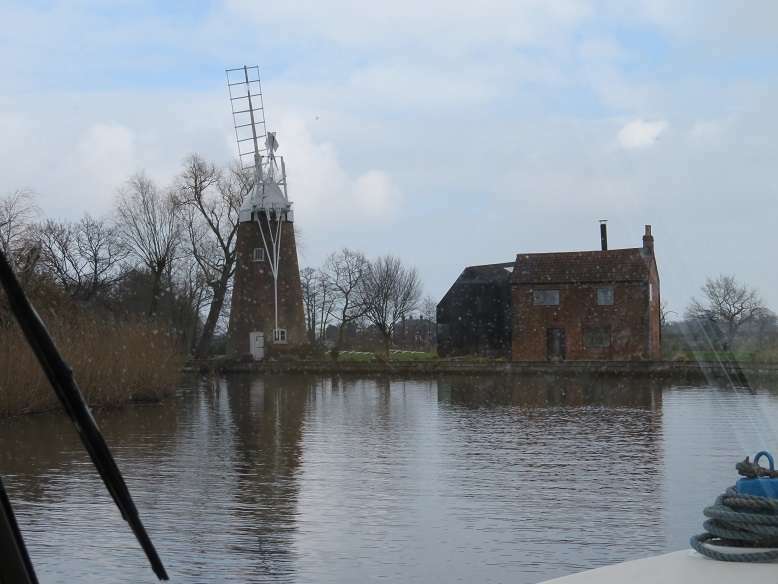 We had considered stopping at Reedham to wait for low water at 5pm, but it was only around 2pm and we decided to continue down the New Cut. (Just before the New Cut we passed Jay on Moonlight Shadow but didn’t realise it at the time – fortunately Jay was more alert than I was and noticed us!) 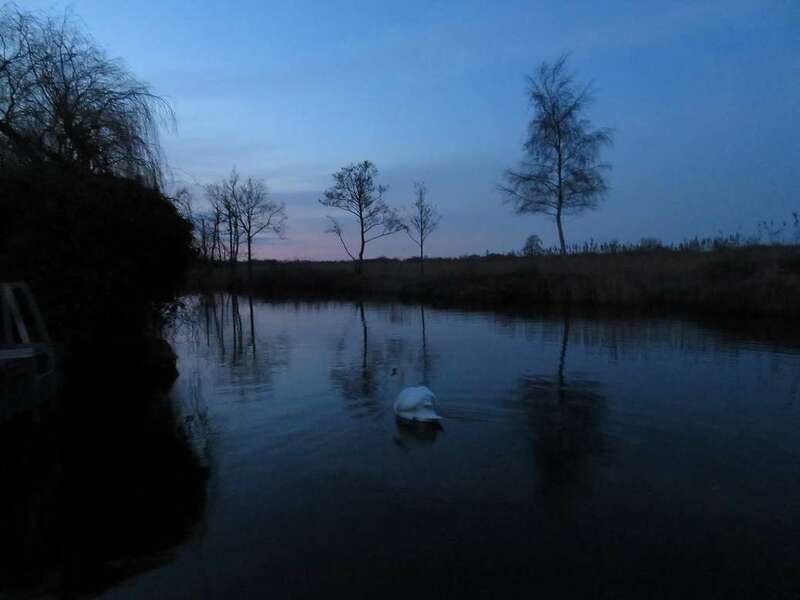 When we emerged onto the Waveney and turned up river we found we were hardly making any headway – wish we could get just a bit more oomph out of the engine! 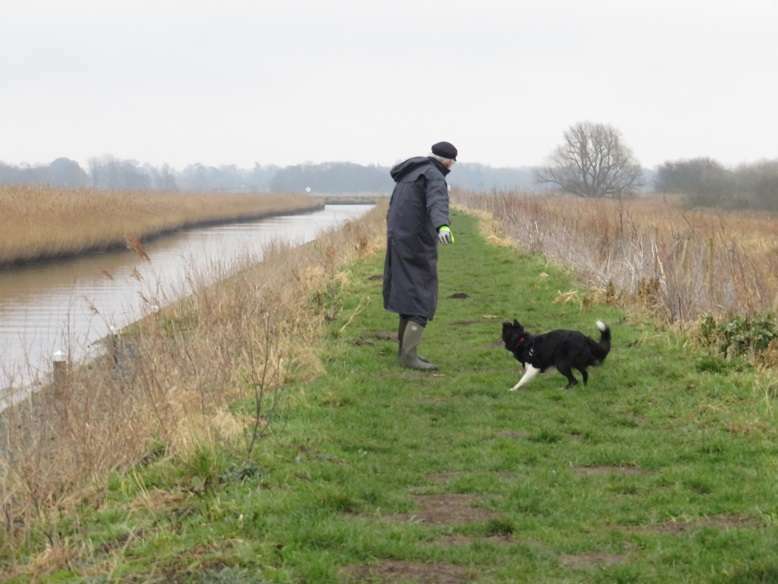 We turned around before we got to the old railway bridge piers and made for the St Olaves BA moorings – luckily there was room for us in front of a large (Brooms?) boat which we ‘ferry-glided’ into quite nicely once we'd turned the boat around downstream. It was quite awesome sitting on the moorings observing the tide rush past so fast. 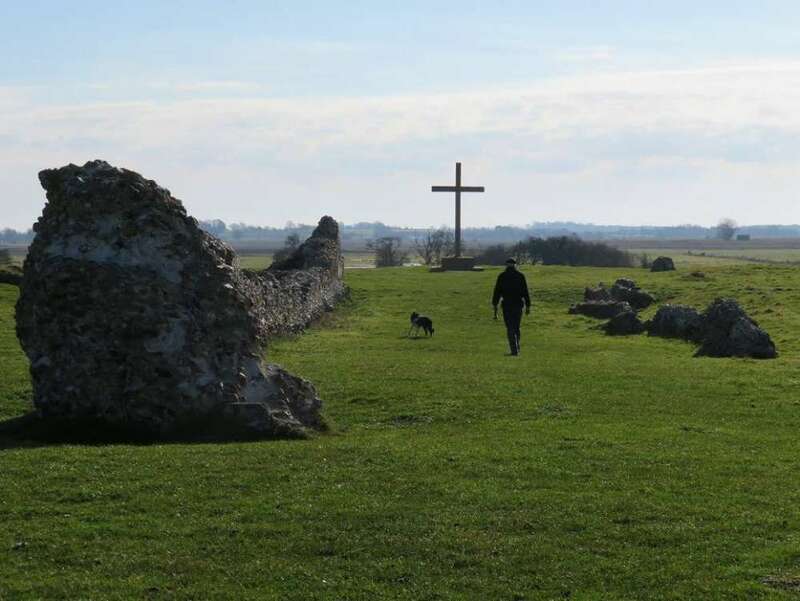 After a short walk with the dog I wanted to search out the ruins of St Olaves Priory. Took a while to work out how to get to them. I first went down a track behind the bungalows that are near the moorings but found I was in a private driveway behind the Priory Farm Restaurant, so doubled back and followed the path behind the bungalows as far as the bridge then up the road and the driveway to the Restaurant, alongside a field containing lamas. At the end the gate leading to the Priory was locked so I had to double back again down the drive and follow a grassy path on the other side of lama field that led to the Priory. Only then did I see a sign that said that the key to access the undercroft was available from a nearby house. I gave up at that point, too tired to walk to and fro yet again, and made my way slightly grumpily back to the boat. 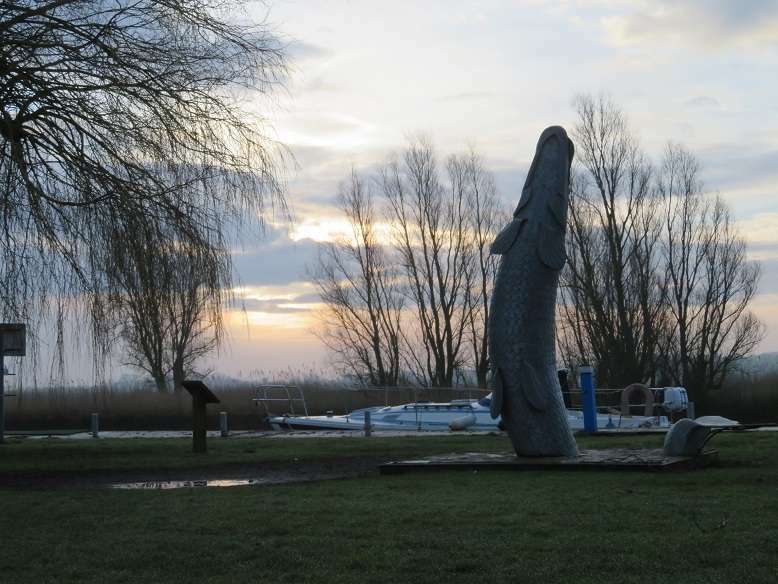 The tide turned as expected at 5pm and we got on our way to the Waveney River Centre. We had phoned ahead to book, but when we arrived found that there was plenty of room. Good TV signal and Wi-Fi signal on site, plus recycling facilities etc. and very quiet. The rain set in again, but we weren’t stirring anyway, being too tired to eat out. We had steak this evening – Graham had bought one decent sized steak in Norwich Morrison’s and we had each had a half of that with veg. Fantastic write up and lovely photos. Some great tips on places to visit too. Thank you! Just out of interest where was this picture taken? If you mentioned it and i missed it apologies. 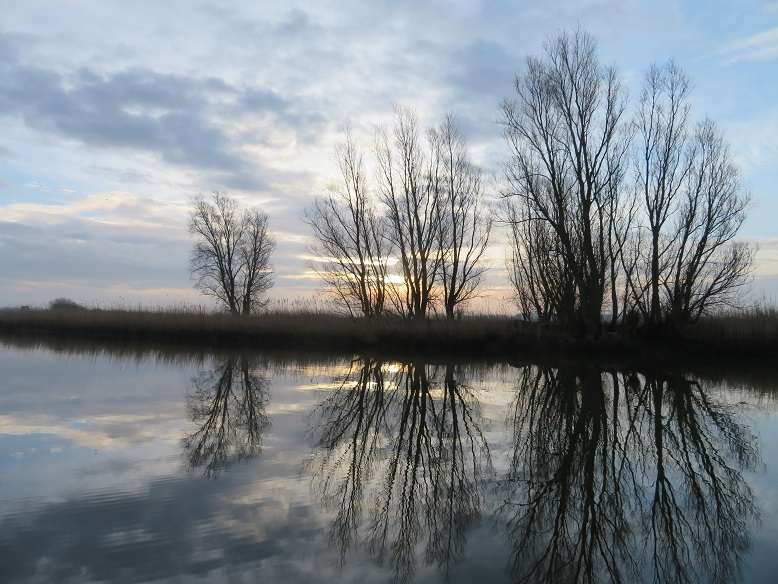 The pic was taken on a wild mooring on the Ant, the east bank I think, not that far south of the bend for the Irstead stretch. I though it would be lovely to stay there overnight, but that evening we wanted some shore power! Fab, thanks I've not noticed that one before I shall look out for it, did you put the mooring stakes in or are they there already? They were there already. I should have added that it’s on a bend of the river...you can’t tell that from the direction I’ve taken the photo. Excellent! That's got to be the tip of the tale! No faffing with rhond anchors! Thanks again. Ant wild moorings tend to be quite good for the avoidance of rhond anchor faffing as you can often use trees. Helen, I really like the picture of Seren looking out the front window as you're heading for Cantley. She looks to be taking a keen interest in the river ahead. Yes, she does that quite a lot...looking out for things to bark at! That's not quite fair really - she's got a lot better recently and has watched swans glide past without a murmur. Canoes though! An early start again this morning. 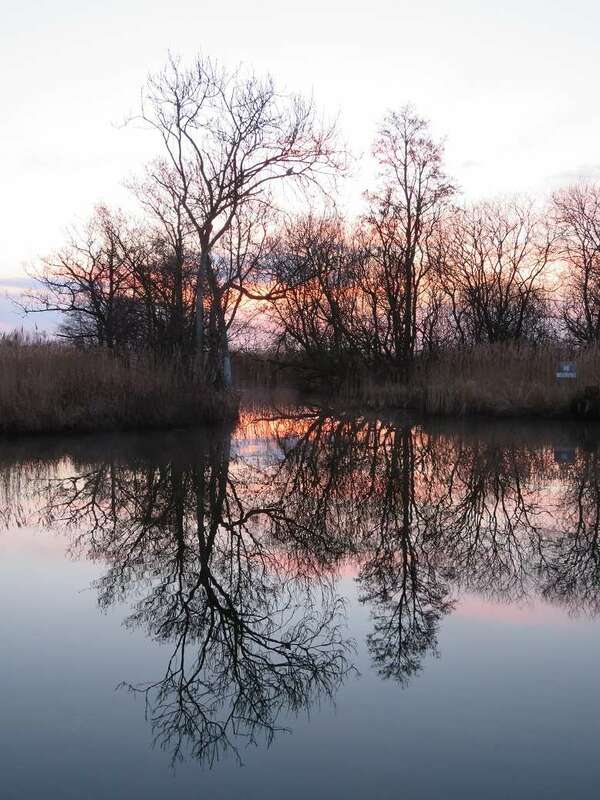 I love it when the river is so still, almost mirror like. 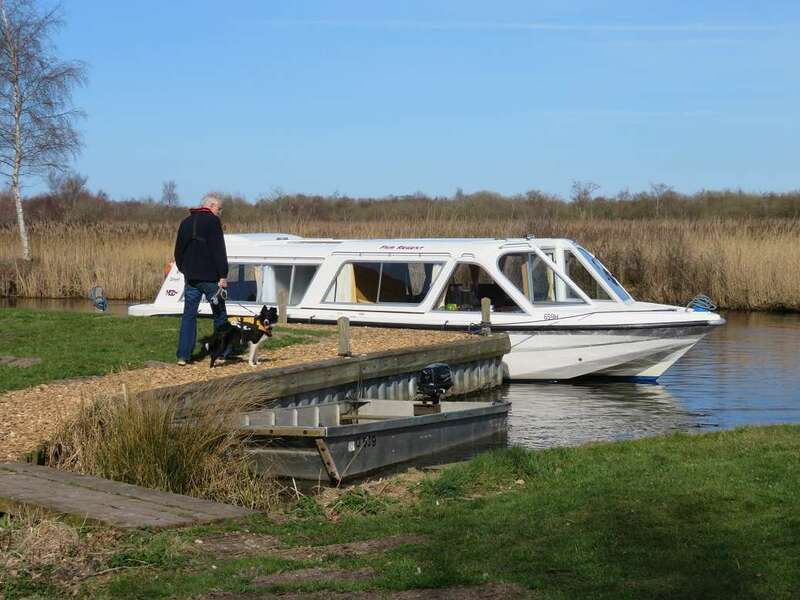 We had a pleasant cruise from the Waveney River Centre up to Beccles, stopping off a Worlingham Staithe on the way for Seren to have some exercise. 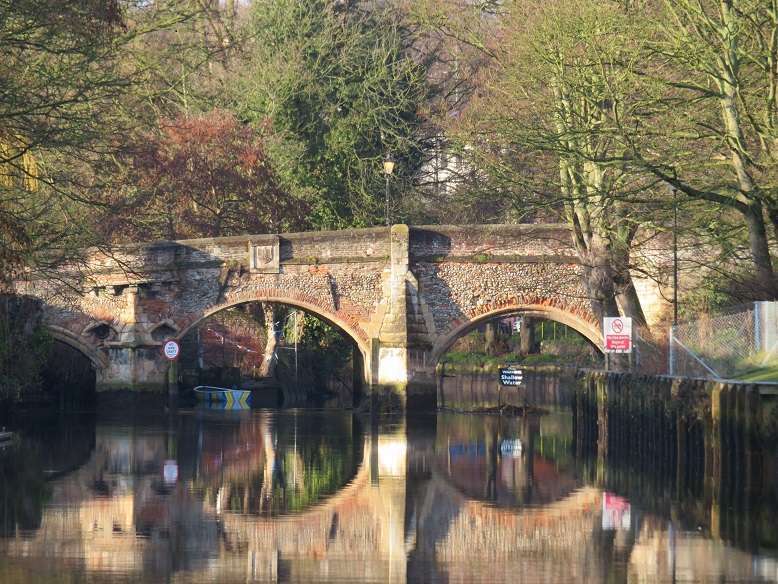 There was plenty of room under Beccles Old Bridge, so we decided to continue on our way to Geldeston for lunch. 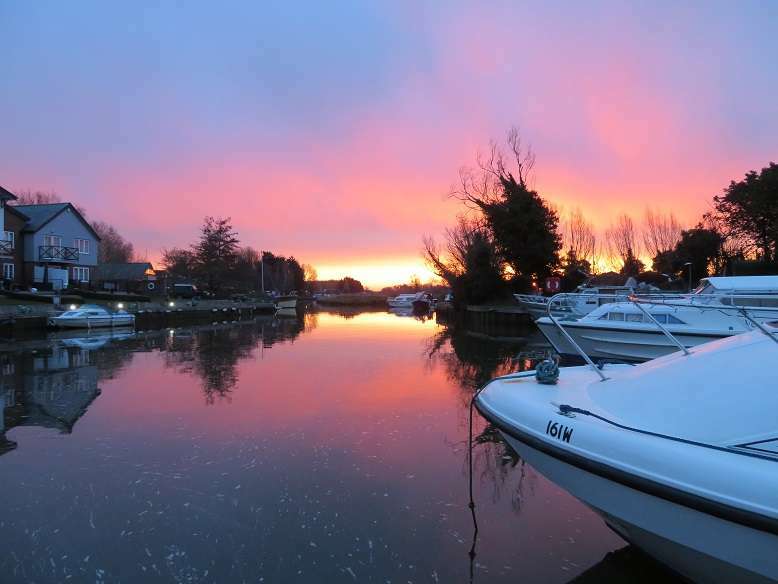 We phoned the Yacht Station as we were passing through Beccles to ask whether we needed to book a mooring for tonight – advised to do so as the Harbour Master/Ranger (whatever you call him) said he was expecting a lot of boats in, most wanting shore power. 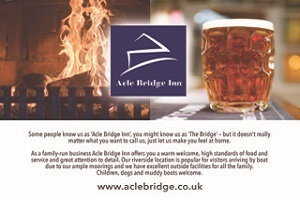 We had been up Geldeston Dyke last year and to The Wherry Inn, so although we had been impressed with The Wherry, this year we thought we’d go up to the Locks as the Locks Inn was due to revert to their summer opening hours from today and its good to try out different pubs. We got there a bit too early (11), but took Seren for a rather muddy walk and then went in for a drink whilst waiting for them to start serving food. First impressions of the pub were good, love the interior and the fire, but then I got served a slightly cloudy half-pint. To be fair, that didn't really put us off, but when we saw the menu we were a bit disappointed, as it had less choice than the menu that they had online (which I had accessed just before arriving at the pub) with some of the more interesting dishes missing. Their ‘Fishy Friday’ specials board didn’t appeal either – and two of the four specials were on the main menu anyway. 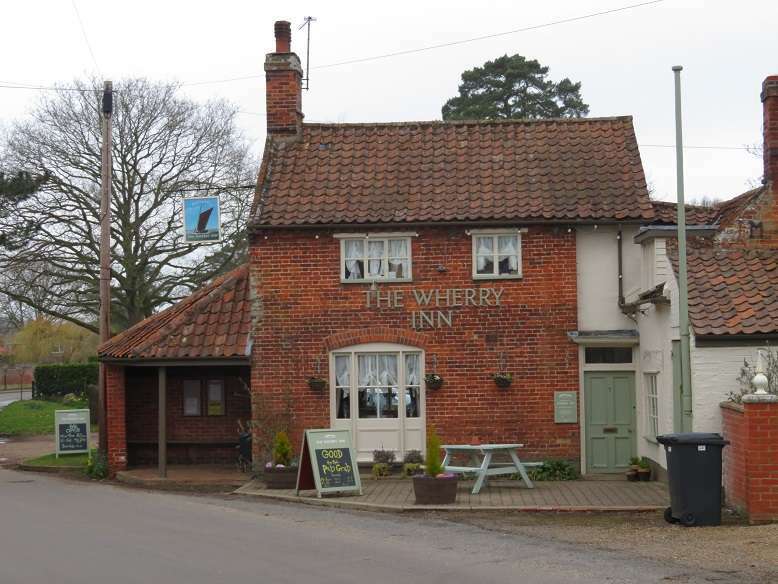 The beer, menu and a few other niggles prompted us to up-sticks and take the boat around to Geldeston Dyke and walk from there to the Wherry Inn. Geldeston Dyke mooring (there are some small posts, but best to use rhond anchors!). The Wherry was busy with locals, some of whom were crowding around the bar, but they gave us and Seren a really warm welcome. Some were taking advantage of the special 2 course pensioner’s meal deal, others seemed to have just popped in for a drink. Great to see a village pub succeeding in pulling-in the locals. Graham enjoyed his lunch – really well cooked fish and chips (he was offered a choice between the smaller pensioner’s portion and the normal portion – opting for the normal one) with a large and thick piece of cod. I went for their Pie and Mash with Jellied Eels ‘East-End’ style special. Never tried jellied eels before and was surprised how good they were, as was the pie and mash. The service was really friendly and efficient too. Made our way back to Beccles Yacht Station after lunch, making sure not to arrive too soon after high tide so as to get back under the bridge. 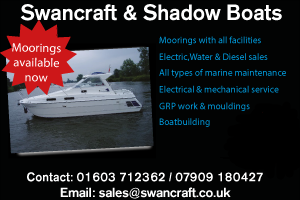 Nice to have the electricity included in the mooring fee. The Harbour Master was very helpful, lending us a longer shore power cable as ours wouldn’t reach the post. The afternoon turned out really relaxing, at least for some! I went off to Morrison’s to replenish our stores of fresh food and we then had a quiet evening on board, having chicken salad for dinner. Watched Masterchef and read for a while. 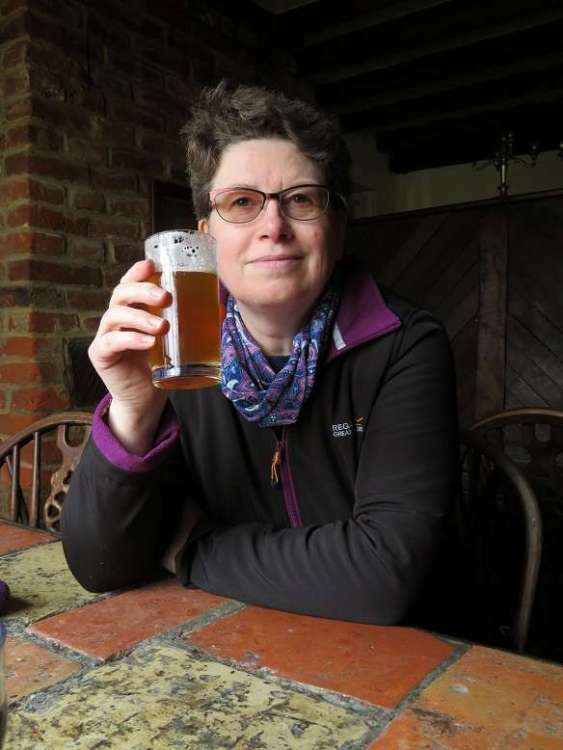 I’ve got a series of crime books by Elly Griffiths on my Kindle that are set in Norfolk (mostly north Norfolk and Norwich). Currently reading the 4th in the series A Room Full of Bones. Our plan today was to make our way back up north, but high water wasn’t due in Beccles until after lunch and slack water at Yarmouth at 6pm so we were planning to stay in Beccles for the morning. 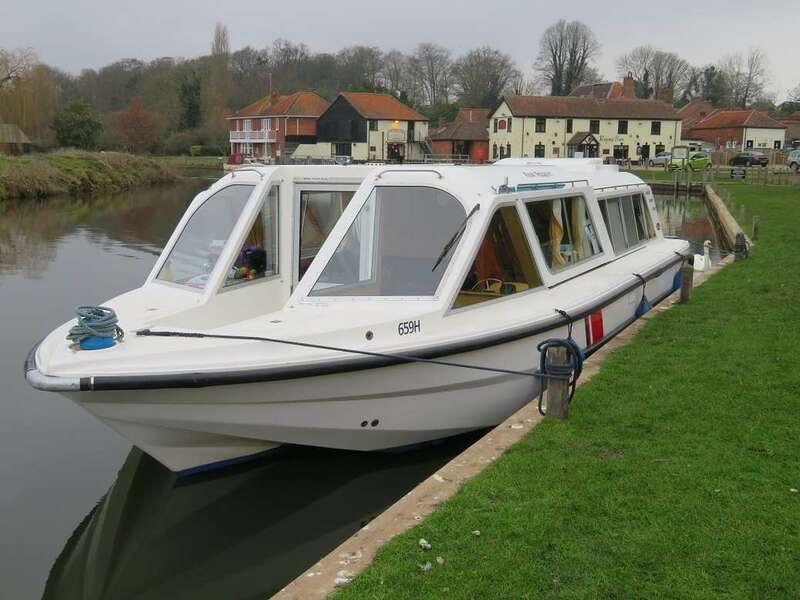 Unlike Norwich Yacht Station, where the overnight fee covers you until 10am the following morning, the fee in Beccles is for 24 hours, so no problem staying on all morning. Since we weren’t in a hurry, we had a cooked breakfast this morning – sweetcorn fritters and bacon. The sweetcorn fritters (basically a thick’ish pancake batter with tin of sweetcorn added) take a while to cook, but we had plenty of time. I forgot that I’d gone to the trouble of bringing some maple syrup with us, that would have made it taste even better than having it with tomato ketchup. I then went up the hill to Beccles town centre to have a look around and buy some meat (yesterday Morrison’s hadn’t the choice of smaller portions that I’d been looking for). Popped into the church to have a look around and found it busy with flower arrangers preparing displays for tomorrow (Easter Day). As I walked down the High Street I noticed people up the top of the church tower, something I’d like to do but didn’t have the energy to get up there today. 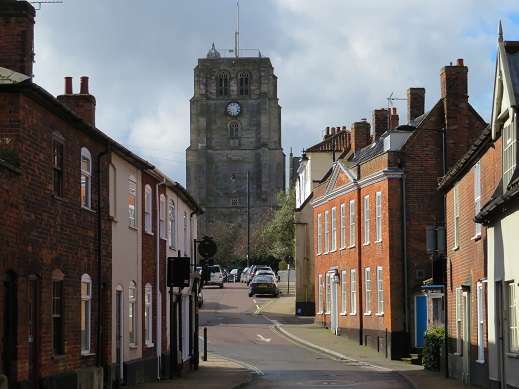 I like Beccles – there’s a friendly feel to the place and there are still a decent number of independent shops in the town centre despite the presence of Morrison’s and Tesco’s. It probably helps that Tesco’s is positioned close to the town centre. 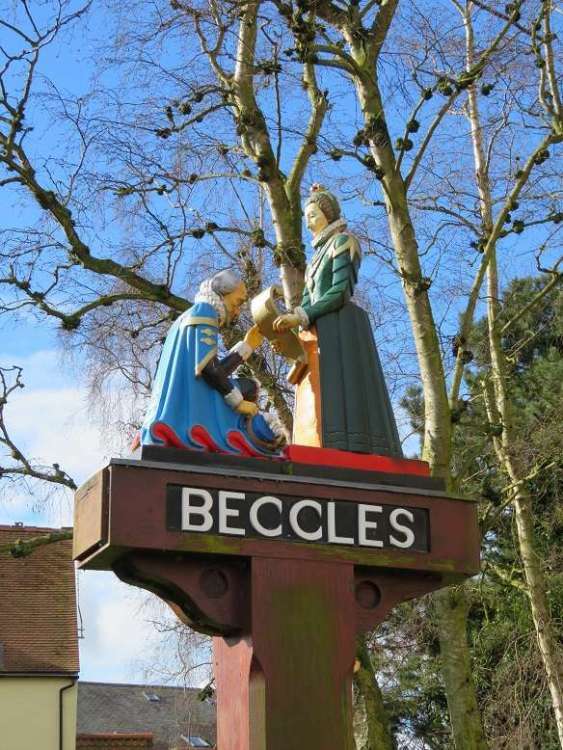 We left Beccles around 1pm. Graham made us some sandwiches to eat as we cruised along. 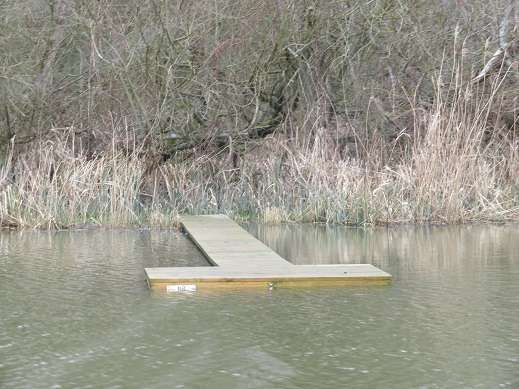 We noticed that the river was pretty high, with some of the fishing platforms being almost underwater. 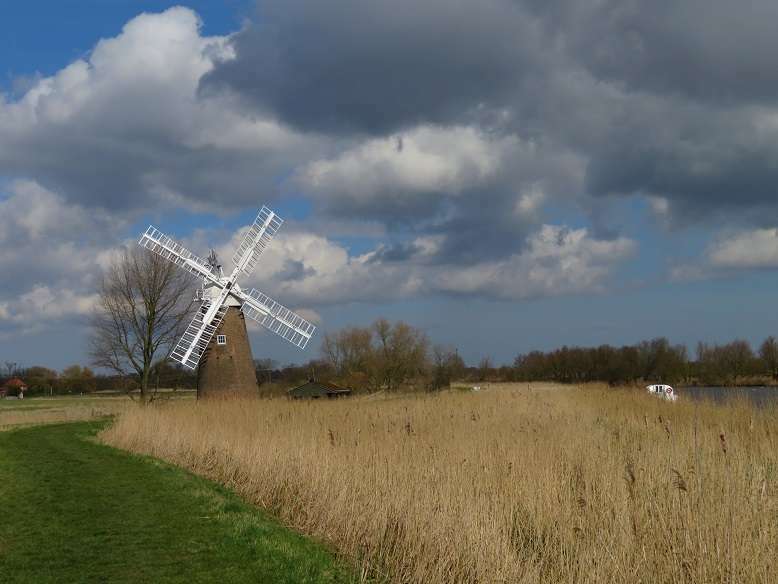 We stopped off at Somerlayton for Seren to have some exercise before the journey through Yarmouth and walked along the bank toward the Herringfleet Drainage Mill. 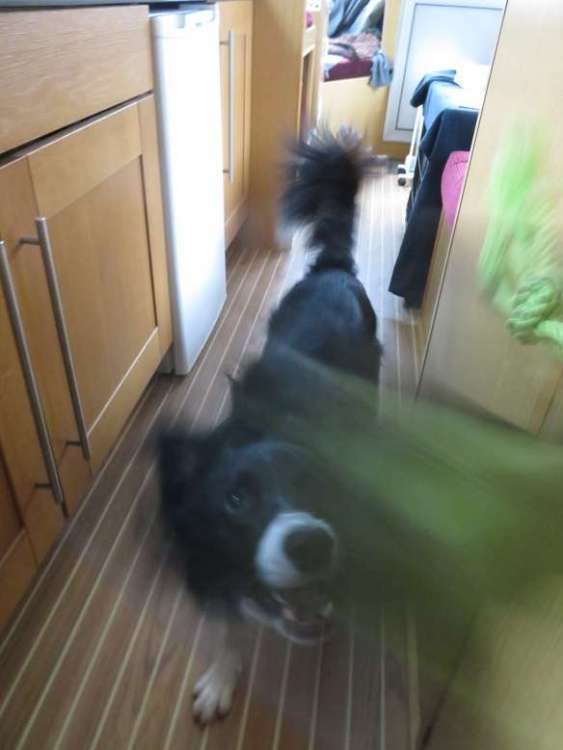 Seren gave us a bit of a fright again. 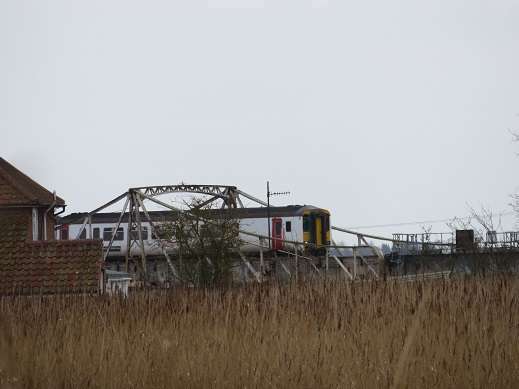 A train crossed Somerlayton bridge and was heading north on its tracks the other side of the river. This was enough for Seren, she chased it up river - I’ve never seen her run so fast (and she’s pretty speedy on normal days) – disappearing around the bend just before the mill. Luckily she came back before we really started to panic, minus the ball that had been in her mouth. Oh well – the main thing was that she was safely back. 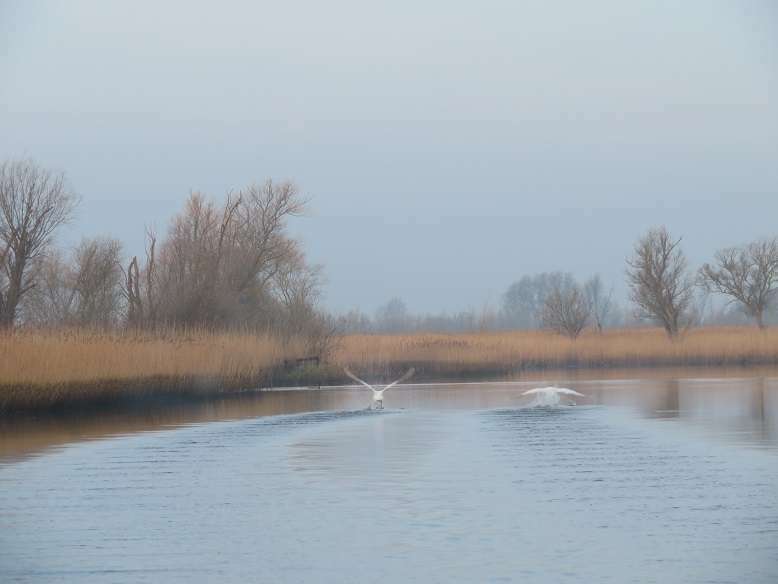 We kept an eye on the time as we continued down river, past St Olaves and Burgh Castle, slowing down after the latter as it looked like we’d be too early arriving at Breydon. It had been sunny but some dark clouds started to overtake us again. Graham and Seren took it easy whilst I helmed. 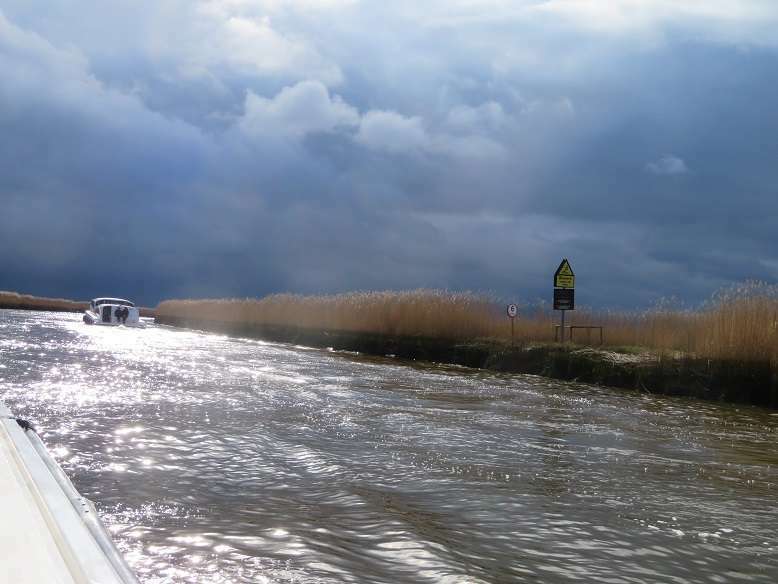 We crossed Breydon Water really slowly, only speeding up when it was clear that the tide was on the turn. 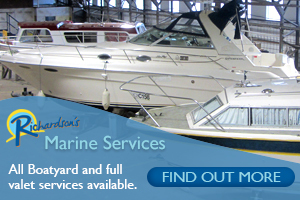 We had phoned the Yacht Station earlier on in the afternoon to check whether slack water was expected at the time predicted in the tide table, and Graham asked whether there would be space if we misjudged things and needed to stay overnight there. They advised that there was plenty of room. Well there wasn’t much space left when we passed the Yacht Station, but we were ‘on time’ and the water completely slack, so we thought we’d be okay getting to Stracey Arms before sunset. We’d not taken into account the lack of 'oomph' in the engine though, and so weren’t able to go any faster than 5mph at most. That meant it was only about 20 minutes before sunset by the time we got to the Five Mile House Mill. We had passed an emergency pontoon mooring just before that, so decided to turn around and moor there, rather than risk continuing in failing light. It was a pretty gloomy evening anyway, even before ‘sunset’. We were quite tired by now, too tired to prepare and eat a big meal, so I took an easy option and just heated up some tinned Sweet and Sour Chicken which we had with a bag of ready-made egg-fried rice. To be honest, it wasn’t great. Rather too hit-you-in-your-face sweet and sour flavour for my liking. The only snag about being on a pontoon without access to the bank was trying to get Seren to relieve herself – she just wouldn’t. Anticipating being woken up in the night by her! Surprisingly, Seren slept soundly last night. She must have had her legs crossed! We got up early today so as to start off shortly after dawn. We weren’t sure if our circumstances the evening before would be judged a sufficient ‘emergency’, and anyway there was Seren to consider. It’s a wonder she didn’t whimper all night. Also, we hoped to be able to find somewhere with an electric post for tonight, preferably up the Ant. That would take some cruising time. It was quite a pleasant morning, milder than it had been last weekend but not very sunny. 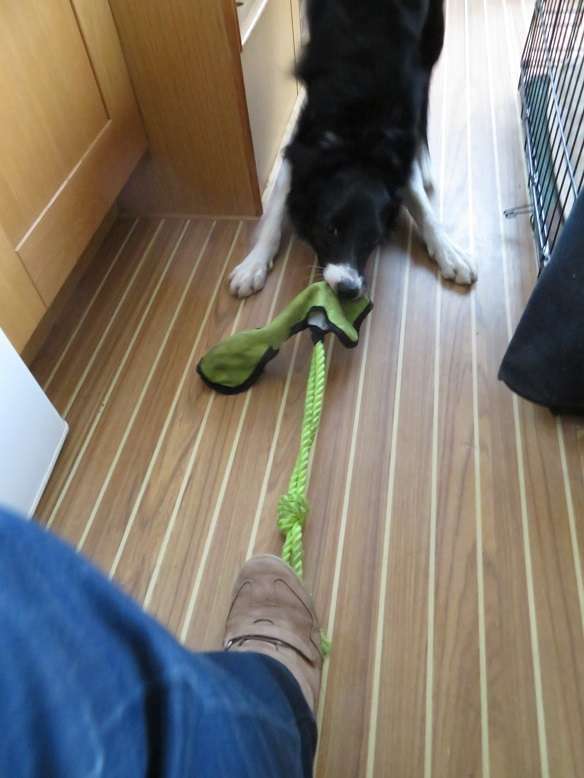 Once we got away from the pontoon Seren started to whimper a bit. 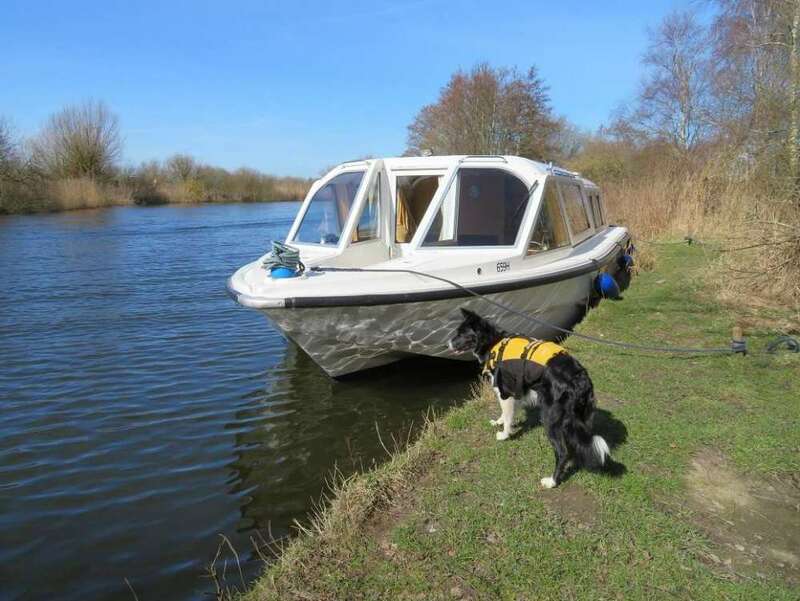 We noticed that there were a couple of BA vessels moored against some key-heading a little further up river, just around a bend where they had a dredging platform, and there was just enough space for us to moor for a short time so that the dog could get ashore. We also stopped for a half an hour or so in Stokesby for breakfast. All the moorings there were taken apart from one space on the BA moorings. 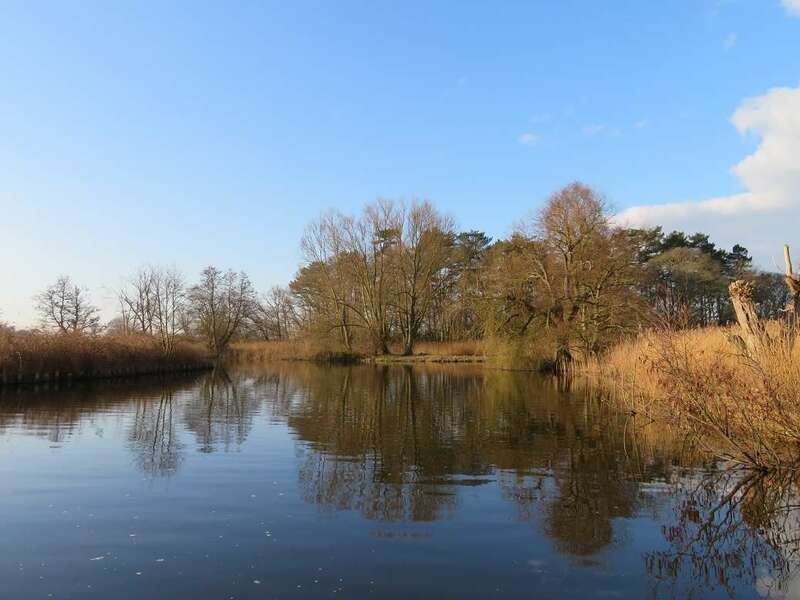 After that we continued up the Bure and then the Ant, noting how busy it was compared to earlier in the week. 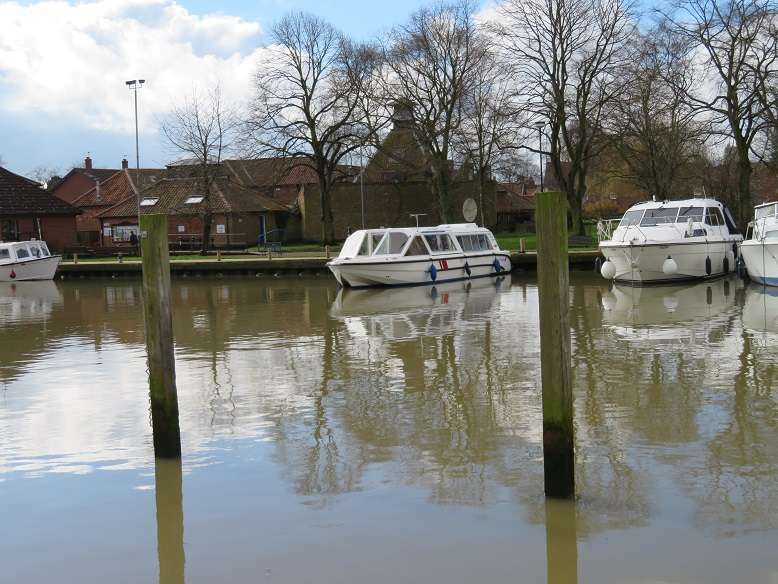 St Benet’s moorings were full as were the moorings at Ludham Bridge. 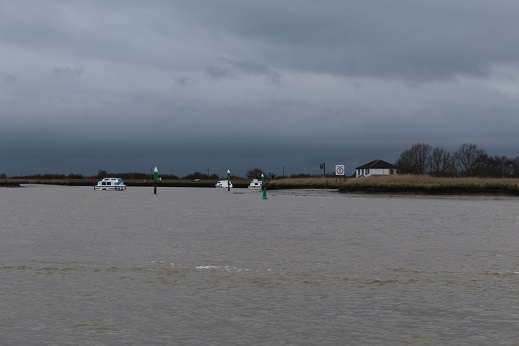 There were eight Hunter’s boats at St Benet’s – good to see so many Hunter’s boats out early in the season. Getting under Ludham Bridge was a bit of a pantomime given there was a stream of boats coming the other way and there were quite a few boats moored on the corner outside the boatyard – luckily the third boat coming downstream gave way and kindly let me through. How Hill was pretty busy and there was a boat on Irstead Staithe. No chance of getting anywhere near the electric point at Sutton, though there were a couple of spaces further down the dyke which were taken by the time we’d turned around. 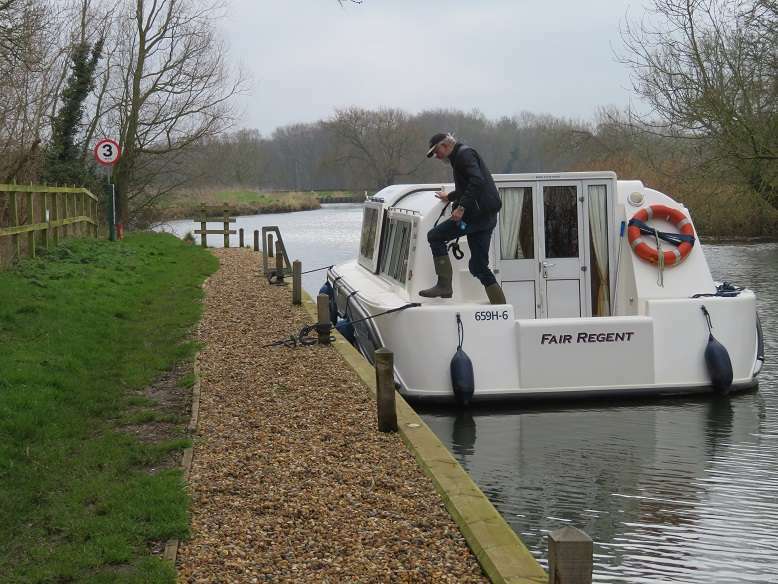 We decided to see if we could get under Weyford Bridge, though we thought this a bit unlikely as there had been far less clearance under Ludham Bridge than there was earlier in the week. If that failed we had spotted a couple of wild moorings on the upper Ant that looked like good options. We were having rain on and off as we continued up the Ant. 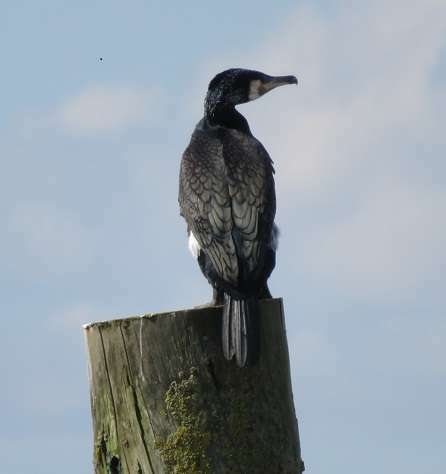 This one was taken as we were passing Hunsett Mill. We got under Weyford Bridge with about 5-6 inches to spare. Slightly worried about getting back under tomorrow (given rain was forecast) but resolved to return through as early as possible in the morning. I could see another vessel proceeding before me up river toward Dilham, but from a distance it didn’t look like a boat with a cabin. 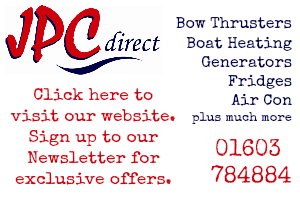 It wasn’t either – when we got to Dilham it proved to be a BA Ranger’s boat (good job I kept my speed down!). 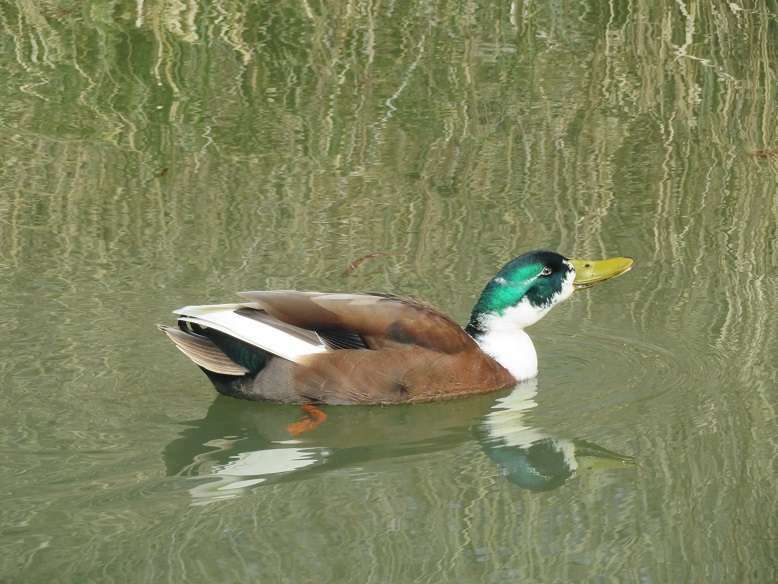 Once they’d left we had Dilham to ourselves for a short time before a couple of private boats arrived. There was only us and one other boat overnight as one party left again after visiting the pub for lunch. Not much to do this afternoon apart from playing with Seren and relaxing. We ate in again this evening. Duck Breasts in Plum Sauce (very handy – just bung in the oven) with new potatoes and green beans. Just read this evening as there’s no TV signal nor any Wi-Fi/mobile signal. Such amazing detail. Did you say that you write a log while you're away? I always think that I will remember what we did and where we went but sometimes struggle to put it all together once we're back. These holiday tales are such a good record of what we've all done. You also sound as if you had a fair idea of what you wanted to do while you were away this time. Hi again Helen, still enjoying this and great photos. I like the one with Seren asleep on the sofa and Graham having to make do with a camping chair! 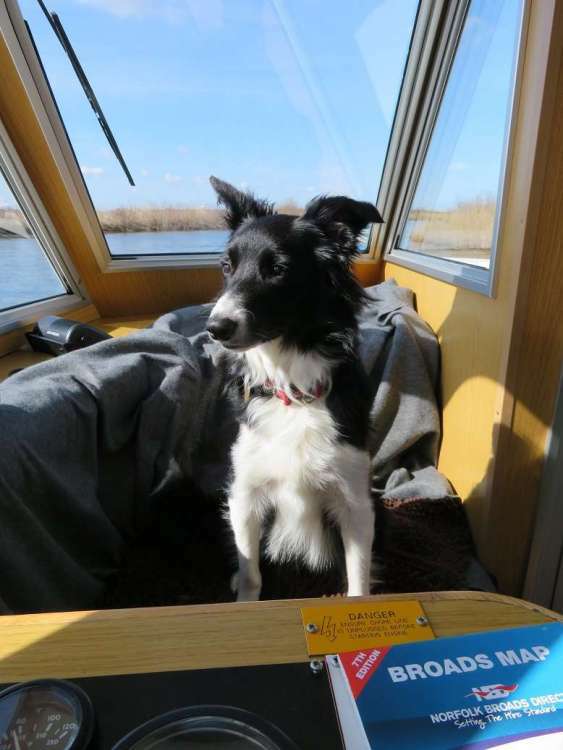 I'm surprised you plan around the tides so much on the south Broads. They make a big difference to your rate of progress and fuel of course but my preference is to give myself freedom and take pot luck as far as the tides are concerned. Similarly with Great Yarmouth, I'll plan for slack but I'm quite happy with an hour either side if necessary.